The annual corn and pork chop jubilee will be August 16 from 11 am to 7 pm! Get your tickets in advance from any member of the local Rotary club. Tickets are $10 and helps fund our donations to numerous local charities. See you at the jubilee! Sara Stadtherr introduced Tyler Notch, Director of Wellness and Cyndi Magnuson, Director of Residential Services from Grand Arbor/Knute Nelson. Phase Two Grand Arbor details include bright open floor plans , patio or balcony on each unit, blinds on all windows, individually controlled heat and central air, gas fireplace, walk-in closets, convenient in-home laundry with washer and dryer. Lots of amenities. Housing choices also include Lakes Senior Apartments, Prairie Assisted Living, Meadow Enhanced Assisted Living. A Town Center at Grand Arbor includes a broad range of amenities. Connie Mondry inroduced Christine Reilly and Jean Bristow, Alexandria Education Foundation. The Alexandria Education Foundation (AEF) is an independent non-profit volunteer organization dedicated to the continued academic excellence of Alexandria Public Schools.They partner with Alexandria Public Schools to provide financial support for unique learning experiences for students in early childhood education through grade 12. The Alexandria Education Foundation (AEF) supports educational excellence and a passion for learning by partnering with our community. Our focus is on funding projects above and beyond the scope of the state budget and local tax dollars. Funds raised will directly impact students through grants to classroom teachers and other funded projects that help support initiatives that further the mission and educational goals of the School District. Tim Moe introduced Grant Haugen, “Fit fore the Fairway”. Grant is a Certified Physical Therapist at Grand Arbor in the newest specialized program that utiliizes the latest research in golf, fitness, health and swing biomechanics from the Titleist Performance Institute in order to keep your body and your golf game at its best. This program offers one-on-one TPI Golf Assessments, giving you the opportunity to experience the same physical assessment and fitness training as the pros regardless of your golf skill level. Grant’s credentials allow him to educate the golfer as to what their body is currently capable of doing and providing corrective exercises. 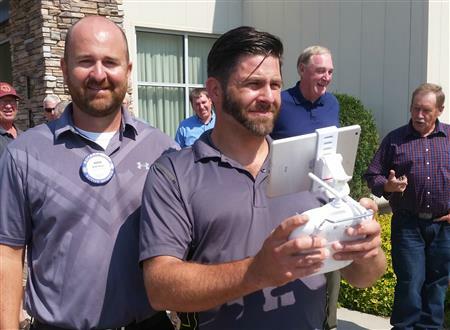 Keith Meyer introduced Danny Sieve, Realtor and Volunteer Fireman; Danny explained how he was using a drone for his business and some rules involving drone usage; some come with better cameras, better handling, more advanced technology, longer flight times, etc. Models are ready to fly right out of the box! Plus demonstrations flying the drone!! 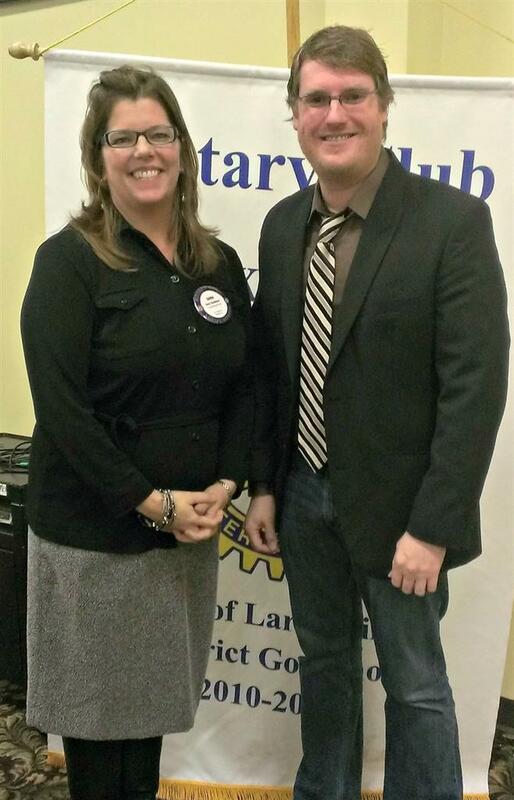 Todd Emmons introduced Tara Bitzan, the new Executive Director for the Lakes Area Chamber of Commerce. 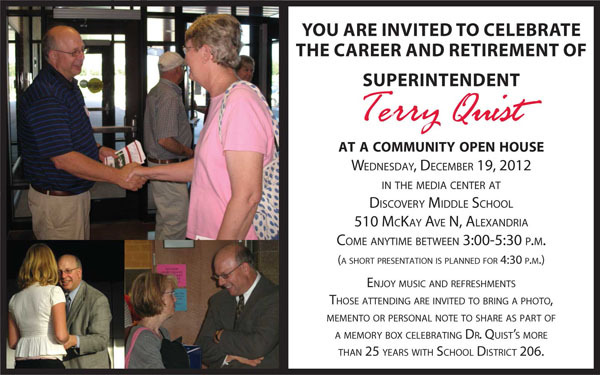 Tara is a life-long resident of Douglas County, with a 25 year career as a community journalist. Tara looks forward to leading this organization and working with so many incredible people to make Alexandria an even better place for people to “live, work, play and prosper." Laura Urban introduced Josh Brummond, Douglas County Veterans Service Officer. 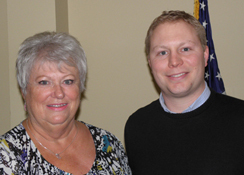 Veteran's Service staff consists of Josh as Department Head and Sandy, Administrative Assistant. They assist veterans/dependents with benefits from the United States and MN Department of Veterans Affairs. They also provide transportation to and from the Veteran's Administration Medical Centers in Fargo, St. Cloud and Minneapolis. Josh works for the veteran. inside as well as the outside. Marianna Khavu, Monticello Rotary Club in center holding scissors, Tracy Nelson, St Michael-Albertville and Larry Zilliox cutting the ribbon dedicating the new school library at Prek Tunung Secondary school in Cambodia. 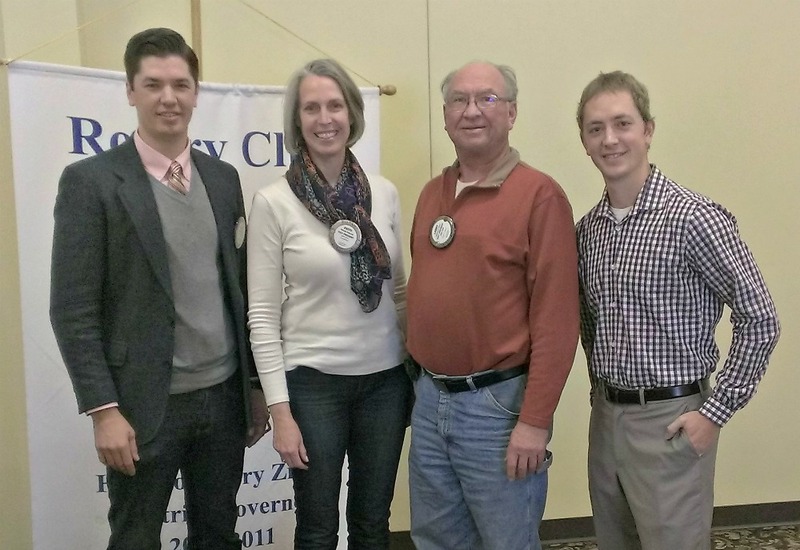 Tyler Golberg introduced David Collins and Sue Tomte from the Park Rapids Rotary Club. They shared their fundraising successes, including funding for a new fitness park, a fireworks stand, and Partners for Pianos for their school district. Their Rotary Club was recognized as the best club in their district with 100% of their member donating to the foundation! 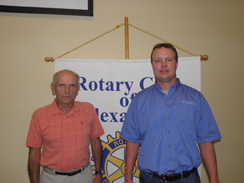 Tyler Golberg introduced Amos Hartsell, OTR/L from Alexandria Rehabilitation. Alex Rehab is a therapist-owned private clinic that specializes in upper extremity treatment. Through advanced study and training, their hand therapy focuses on treating conditions affecting the shoulder, elbow, wrist, and hand. Amos has expertise in traumatic hand injury rehab as well as common repetitive work-related or general injuries. Amos has his Masters in Occupational Therapy from the University of ND. Vic Dale introduced Julie Boyle and Anita Sheehan from The Caring & Sharing Room, which is a volunteer ministry of The Church of St. Mary. It is supported by churches, organizations, and individuals from the local area. Their mission is to provide furniture and household items in good condition to needy families in Douglas County through referrals from approved community service and crisis agencies. The needs in our community are great and Caring and Sharing needs help in meeting those needs. Monetary donations area also welcome. Please make checks to St. Mary's designated for the Caring and Sharing Room. Over one hundred volunteers help in one way or another. New volunteers are always welcome. The Caring and Sharing room is open by appointment for donation drop offs Thursday morning from 9-11am at the Cedar Building (formerly the Marian building). Beth Telander introduced Dr.Michael Worth-Davis, CEO Goodwill-Easter Seals. They accept donations of clothing, shoes, housewares, decor, electronics, sporting goods and other quality items. Seasonal items are also welcome. Your donations are sold locally in Minnesota and Hudson,WI Goodwill stores. They support local job training and placement programs that eliminate barriers to work and independence.Goodwill-Easter Seals Minnesota main programs provide employment services specifically designed for employment.Wrap-around approach, taking into consideration the individuals needs, including those that affect their ability to obtain and maintain employment. They also offer services to support individuals to advance in their careers after job placement. lasting impact.Give and become a part of Rotary's life-changing work! Our Foundation campaign runs through the month of April. On-line or checks to Patty Peterson are just a couple ways to donate! Todd Emmons introduced Tyler Golberg, a web designer with CYBERsprout. Tyler discussed the online presence of the club and how we can reach more people within our community. The main focus going forward will be to increase social media reach with more activity, promotions, and an easier way to submit content. Search engine optimization and website content will be used to support these efforts. Daylon Faber introduced Adrian Panther from Panther Distillery in Osakis. Panther Distillery is Minnesota’s first legal whiskey distillery! With hand-selected Minnesota-grown ingredients, American white oak barrels, and their 500 gallon Kentucky-built still they make the best tasting distilled spirits. Fresh ingredients are always the best, locally grown yellow corn, red wheat and red rye are used in their mash.Tours available daily and no reservations are necessary.White Water Whiskey, Spiked Apple Spirits and MN 14 Whiskey are some of their products available. Dream It. Do It. Minnesota is a collaborative grassroots effort between manufacturers all around Minnesota that want to tell the world about why they love the manufacturing industry. The purpose of the Dream It. Do It. 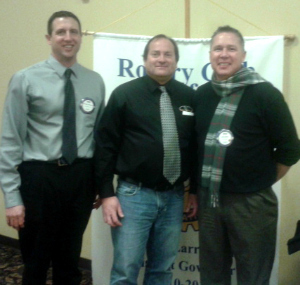 Rick Paulsen introduced fellow Rotarian Cliff Korkowski, Douglas County Car Care Program. The DCCCP is a 501-c3 nonprofit corporation that is faith based and represents a community coalition uniting the social service agencies and faith-based social ministries addressing people in poverty challenged with transportation barriers. The annual Rose sale is under way! This year we are selling long stem lollipop roses for $20 per dozen. Order from any Alexandria Rotary Member prior to October 29 or purchase a dozen or three at ABR Realty (1210 Broadway) anytime between 10:00am-6:00pm on Thursday, October 29, 2015. Tim Murphy, 2015/2016 District 5950 Governor shared success accomplishments from this past Rotary year. Our District generated $94,213 in donations for Polio Plus. District 5950 also remains a leader in the amount of annual giving to The Rotary Foundation. Jeremy Anderson introduced Carl Vaagenes, CEO Douglas County Hospital. Our hospital is a general medical and surgical hospital with 99 beds. It is accredited by the Healthcare Facilities Accreditation Program (HFAP), has a Level III trauma center and has twice been named as one of the Top 100 Hospitals by Thompson Reuters. Our Mission at Douglas County Hospital exists to provide quality health care services, to meet the needs of our customers and demonstrate our commitment to excellence. 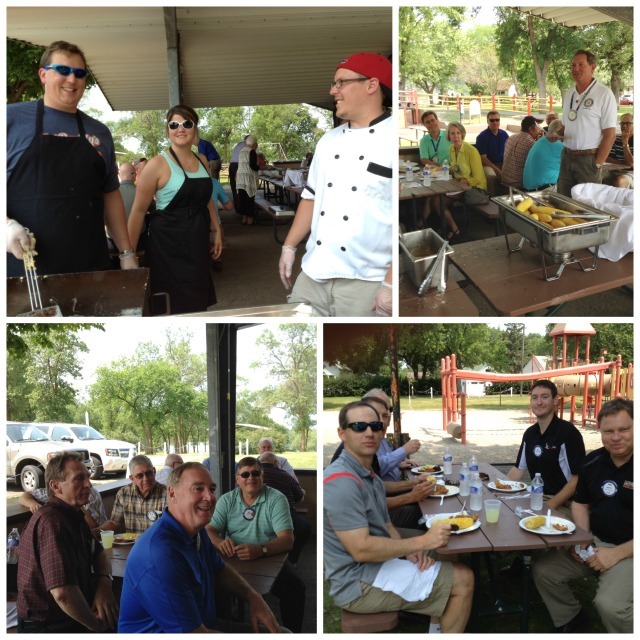 Every year we do a fish fry in City Park and encourage members to bring guests. Guests included Fred and Terri Bursch, Janet and Christa Bolm, Sandy Emmons, Glenna Gibbons, Trudy Blanshan, Bill Nettleton, Howard Peterson, Bruce Pohlig, Carol Tillitt, Darlene Murray, Deb Ristvedt, Tim and Joanne Gess, Kris Dolan, Rachel Golberg. Rachel Barduson also shared fun facts about the lakes in the surrounding Alexandria area with the club and guests. Ben Whitten introduced Aimee Goodwin from the Minnesota Lyme Association. Minnesotans across the state are at risk for acquiring tick-borne diseases. The highest risk is in the south-east, east central, and north central areas of the state. Grassy fields, brush filled wooded landscapes and places where residential neighborhoods meet the forest edge are prime tick habitat. Lyme disease is an infection that can involve all organs of the human body, including the brain and central nervous. Lyme disease is treated with antibiotics. Check yourself and your animals for ticks immediately and for several days after being in a tick-infested area. Visit their website at: www.mnlyme.org for additional information. Pat Kalina introduced Dwayne Paul, NorthStar Christian Academy - most students would register and graduate from District 206 and to use NorthStar Christian Academy as a valuable supplement to their public school education. NCA will be a non-public, full curriculum school for grades 9-12. It will comply with the Minnesota Department of Education requirements so as to be a 'recognized school' by the state of Minnesota. Another component of their vision includes Fellowship of Christian Athletes Hockey. The national headquarters will make Alexandria its home in spring of 2016. NCA would work closely with FCA Hockey's ministry of the four C's (Camps, Community, Coaches, Campus). FCA Hockey does not intend to have a high school team, but would provide a high level U16 and U18 team for both boys and girls. Along with the increase in hockey camps and play, it plans to build an ice rink "to bless our community and in support of the folks interested in hockey, figure skating and other rink activities." Rick Paulsen introduced Dale Stinton, Lars Nelson and Craig DeJong from the Pioneer Heritage Conservation Trust. PHT works in the four counties of Pope, Grant, Douglas and Otter Tail. Their mission is to carry out local conservation. One of their many projects includes the Mallard hen house building, which involves installing and maintaining duck nesting cylinders for more than twenty years. Dustin Tomoson introduced Paul Lundeen, MN Darkhouse & Angling Assn. Paul is the President of the MN Darkhouse and Barb Lundeen is the secretary-treasurer of the Alexandria Mid-State Chapter. The state has 16 chapters including Brainerd, Central, Detroit Lakes, East Central, East OtterTail, Northern Lakes, Heartland, Iron Range, Metro and Alexandria GS Mid-State Chapter. The Darkhouse and Angling Association was organized to educate the public about the heritage and methods of dark-house spearing. They take pride in efforts to promote spear fishing, support fish decoy carvers and good fellowship for all members. 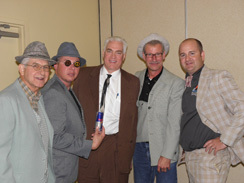 The Mid-State chapter sponsors the Rudy Zwieg Decoy Show at the RCC each year. Last Week’s program: David Hartmann introduced members of the Alex Area High School Volleyball team (Gretchen, Morgan and Amanda) and their coach Becky Schlichting. Activities and athletics play a key role in the Alexandria School District. All persons involved with school activities are expected to follow codes of standard including: Respect, Honesty, Kindness, Responsibility and Fairness. Looking forward to a great volleyball season. Thanks to everybody for helping us make the Corn and Pork Jubilee a success! Check out the photos and numbers from this year's event. Beth Telander and Tom Wacholz introduced representatives from Goodwill-Easter Seals. The mission of Goodwill-Easter Seals Minnesota is to eliminate barriers to work and independence. In the past year 4,976 participants received their services. They partner with more than 119 government and nonprofit organizations to connect participants with community resources to address other work-related needs and assist them on the road to independence. Goodwill provided more than 63,000 services to 30,000 people in 2013. The club once a year meets up at City Park for delicious walleye, good conversation, and a chance to enjoy the nice weather (with a little luck). 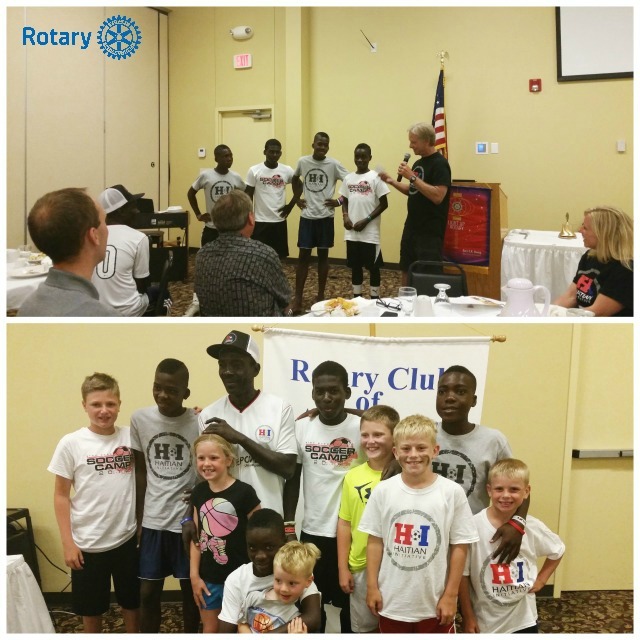 Tom Roos, HS girls soccer coach, talked about the Haitian Initiative which is helping youth in Haiti through education, nutrition, and soccer. Tom coordinated members of the Haitian boys soccer team (ages 12-13) to attend his soccer camp in Alexandria. The team recently competed in the world match in Blaine MN, which they won. Members of the Haitian soccer team, their coach, and host families attended today’s meeting. Although their English was very limited one could sense their appreciation for their US experience. 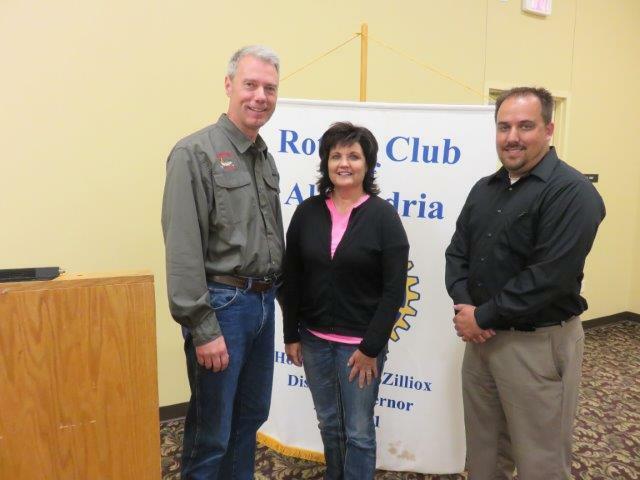 Alex Rotary welcomed District Governor Jim Nelson. 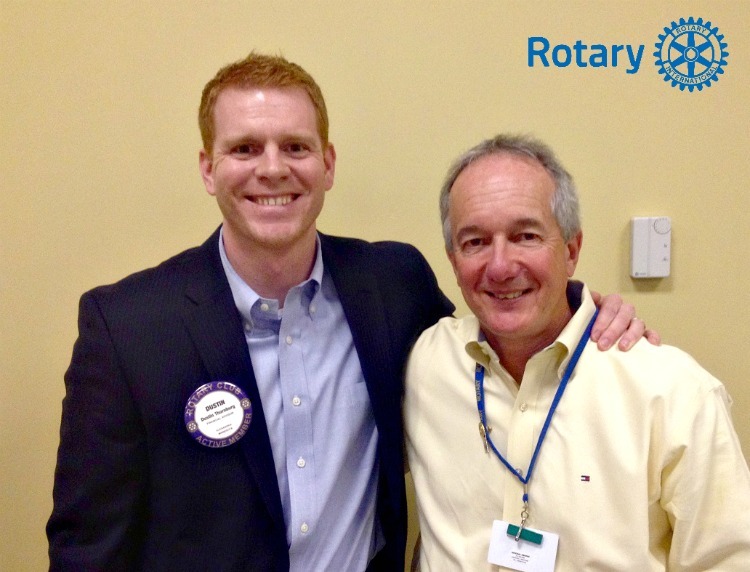 Jim is a member of the Mpls City of Lakes Rotary Club. 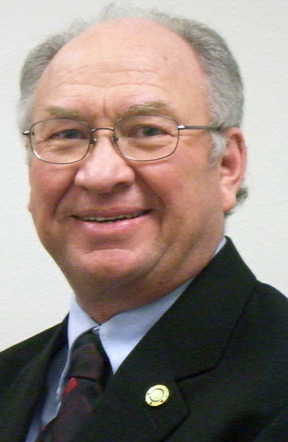 Jim joined City of Lakes in 1999, has been active in all of the areas of service with the club, and served as club president in 2009/10. Jim’s district level service has included past Area 10 (Mpls) assistant governor and District foundation board member. 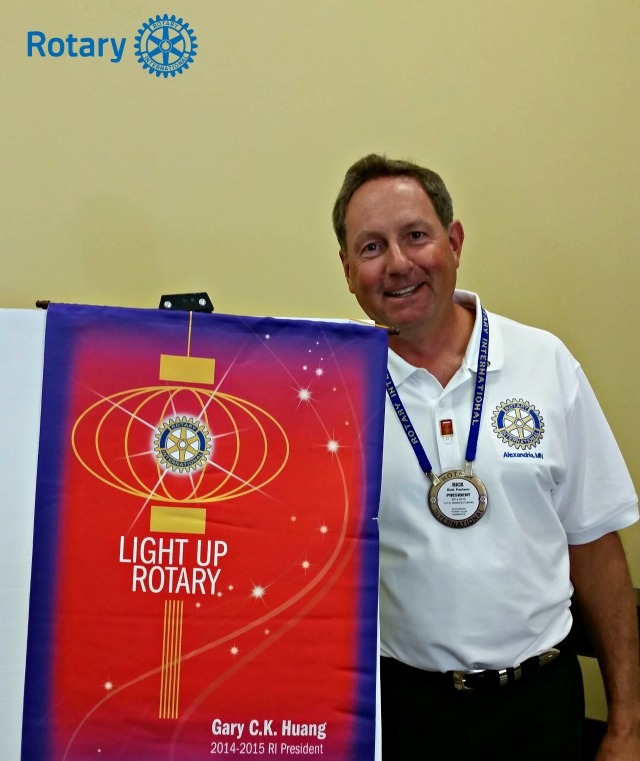 The Rotary Theme this year is “Light Up Rotary”. Together we can light up the world! Please strike your match and light a candle and light up Rotary to make this a successful year. 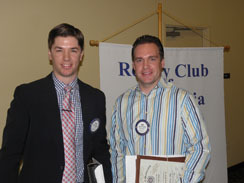 The club also recognized Rotarian Eric Ristvedt for becoming the latest Paul Harris Fellow. Tyler Golberg introduced Judy Peterson and Jean Bristow from the Elder Network. Elder Network has volunteer peer visitors and a professional staff to meet with older adults in their homes weekly to provide support due to life changes, loss, loneliness or emotional concerns; all volunteers receive training. Services are for people 55 and older. Respite care allows the caregiver to take a short break from their duties up to four hours weekly. Respite Care also provides companionship, conversation and assurance that someone cares about their well being. 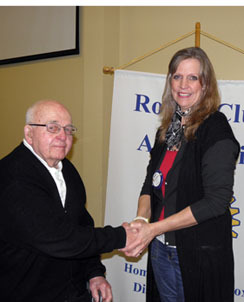 Greater awareness for club members for Rotarians who are ill, etc. Together we are going to have a fantastic year! Tom Haase introduced Andy Mellgren, Liquor Operations Mgr. for City of Alexandria Downtown Liquor and Plaza Liquor. Net profits from the liquor stores go back to the community – through the Park Dept, Alex Fire Dept and RCC if special needs occur that were not included in the general budget. Currently the liquor stores offer discount promotions that support the downtown businesses during the construction period. 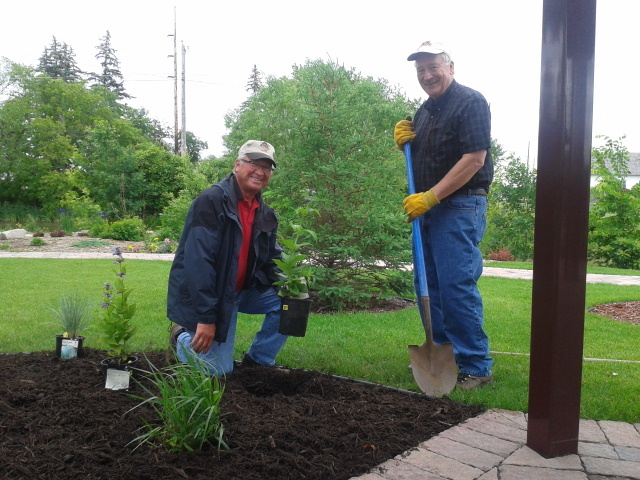 Rotarians finished planting the area around our gazebo in the gardens. The Maritime Gardens are a wonderful venue for live music – free concerts will be held in the gardens throughout the summer thanks to community sponsors – Rotary is the sponsor for June 20th concert! Stan Finnestad introduced Kelli Wendel, Habitat for Humanity. Based in Douglas County, HFH exists as a nonprofit, Christian housing ministry that seeks to eliminate poverty housing in the community and to make simple, decent shelter a matter of conscience and action. You don’t need to look too far to see the difference that Habitat for Humanity of Douglas County (HFHDC) has made in the lives of families in our community. Since 1997, the affiliate has built or renovated homes for 38 families, partnering with them by providing a hand up for a better future. Gary Gibbons, introduced Dr. Florian Ledermann, co-founder of the ”Miracle of Birth Center” at the Mn State Fair. The Miracle of Birth Center, a one-of-a-kind agricultural education exhibit, is the birthplace of nearly 200 calves, lambs, goats and piglets during the 12 days of the Minnesota State Fair and the most popular free exhibit on the fairgrounds. The exhibit is staffed by veterinarians, members of the Minnesota Veterinary Medical Association (MVMA) and FFA students. With live births and newborn farm animals, the exhibit highlights the importance of animals to our economy, health and quality of life. Wayne Elton introduced Greg Trumm from the Alexandria Education Foundation. AEF is a non-profit organization that partners with Alexandria Public Schools to provide financial support for unique learning experiences for students grades K through 12. In 2013 the Foundation awarded over $90,000 in grants and gifts, gifted over $700,000 for the construction of Alexandria Area Hgh School, increased the Endowment Fund, hosted the 7th annual Hall of Fame and the 5th annual Jean & Jewels, and sponsored the student Showcase Celebration and Alexandria Alumni Magazine. A donation directly benefits all who are involved in our extraordinary school system. Todd Emmons introduced Jerimiah Moerke & Brad Cegla, MN DOT. They reviewed different phases of construction for the 2015/16 Hwy 29So roundabout project and I-94 bridge replacement project. 2015/16 will include temporary widening, closed and under construction areas of HiWay 29 S; temporary signals, ramp closures; left turns completed with the Roundabout, completed at CR87 and Co Rd 28 – all to improve traffic flow. 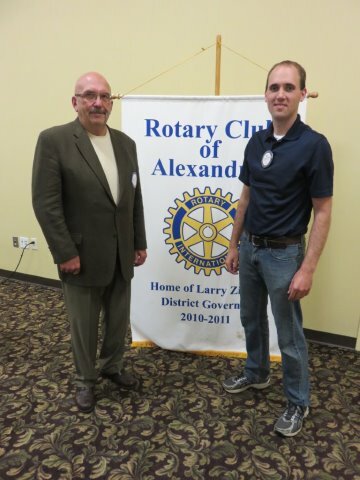 Rod Eldevik introduced fellow Rotarian Rick Lahn who provided us with a power point presentation of the new Alexandria Area High School. Building completion is scheduled for June 1, 2014. With the opening of the new Alexandria Area High School, a district-wide grade configuration shift to a K-5 elementary, 6-8 middle, and 9-12 grade level model will be implemented. The new high school will be organized into smaller learning communities, known as The Academies of Alexandria. Learning Academy Choices are: Freshman Academy; Engineering, Manufacturing Technologies & Natural Resources; Health Sciences & Human Services; and Business, Communcation & Entreneurship. Community Tour Open House is scheduled for August 5. 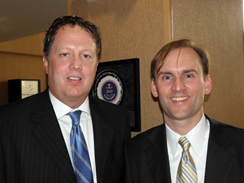 Randy Eggen introduced Andrew Soderholm of Soderholm Oral Surgery and Implants, a new dental clinic in Alexandria. This office practices a full scope of oral surgery from the common wisdom tooth removal to corrective jaw surgery. They can also treat more specific conditions, like TMJ or facial injuries. Check out their website here for more information. JoEllen Doebbert introduced her husband, Belvin Doebbert. Belvin presented a video on his steam launch project: Owotanna Wohdaka–a vessel for arts, education and living history. Pope County Historical Society records reveal that one of the patriarchs of Glenwood was John Quincy Hook. Mr. Hook moved to Pope County in 1880 and it is known that he brought with him a love of boats, steam vessels included. Pope County records verify that he did possess and operate a steam launch soon after he moved here. Belvin plans to start recreating that steam launch this year. 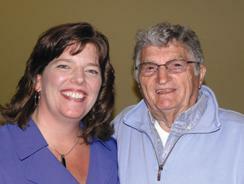 Vic Dale introduced Tammy Boushek who explained Love Inc (Love In the Name of Christ) is a Christian based non-profit. They help to provide services to those in need through our local churches. They are a Christ centered organization. LOVE INC is you, the Church, reaching out to people in need in our communities with the transforming love of Jesus. Share your skills, share your gifts, share your interest, share your time, Bless others! Larry Zilliox shared his experiences on his recent trip to Bhutan. 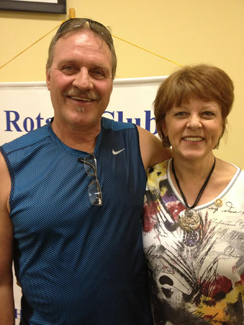 Half a globe away, District 5950 Rotarians help make the world a more beautiful place. 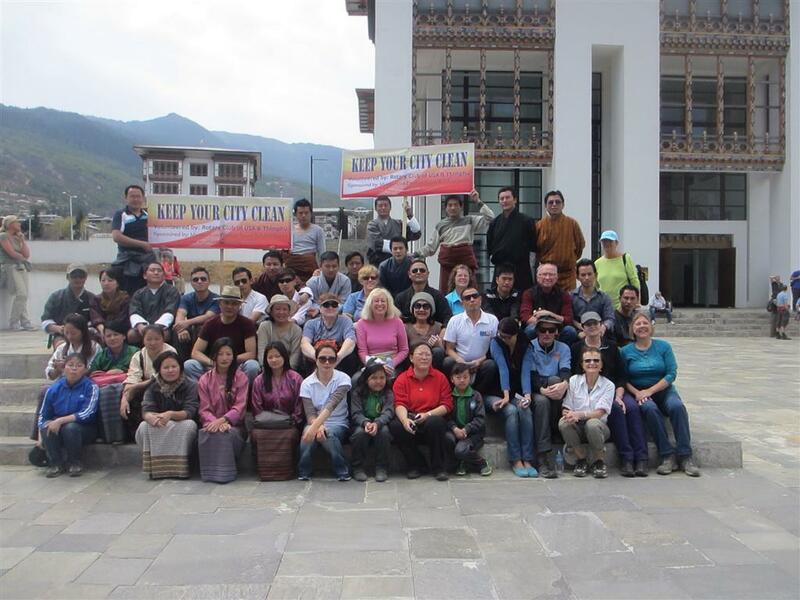 On March 15, the Rotary Club of Bhutan and District 5950′s Friendship Exchange group partnered to clean up litter in downtown Thimphu, Bhutan. One of the two garbage trucks donated by the Bhutan club was half full by the end of the morning. A local TV station filmed the joint Rotary project and included a short clip on that evening’s news. As the Rotarians cleaned up the streets, ideas were exchanged and friendships developed. Brian Gibson introduced Tim Bush and Larry Ortloff, Chair for the YMCA “Continue the Dream” Capital campaign. A 2,800 sq ft multi-purpose space would provide the ability to accommodate more group exercise, multiple classes at prime times and structured gross motor skill space for child care and child watch children. The new Child Watch Center will be 1,500 sq ft, approximately two times the current space; Outdoor Field Space will facilitate new program development for youth, adults and families. To reach the J.A. Wedum Foundation Challenge Match, $218,000 is needed to meet the Challenge Match and reach their Campaign Goal. 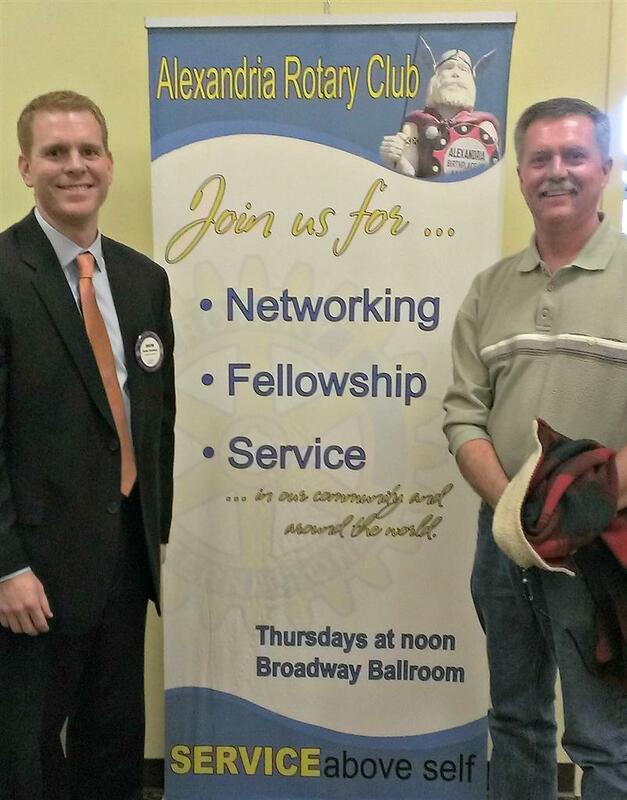 Dustin Thornburg introduced Bob Halagan, Buffalo Rotary, District 5950 Foundation Chair. This year we are going to try something different for our Rotary Foundation Drive, using a Pledge and Give format. Every year Rotarians are encouraged to make a donation to the Rotary Foundation. The donations we make are used to fund Rotary projects around the world. Our club’s donations are also used to determine how much money we are able to get back from the foundation to fund our LOCAL projects. The Foundation, through a grant program, empowers Rotarians to approach challenges such as poverty, illiteracy and malnutrition. Our goal as a club is to reach 100% participation! Foundation drive begins April 3 and continues through our April 24 meeting. 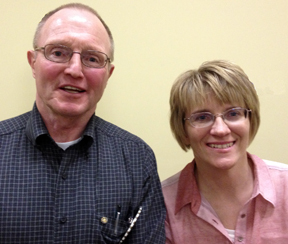 Bill Bolm and Hans Dahl, pastor from Calvary Lutheran, shared experiences from their fall journey to the Holy Land. They walked the same roads Jesus walked in Bethlehem, Jerusalem and around the Sea of Galilee. Lynelle Brickweg introduced Al Newman, former Minnesota Twin baseball player. Al Newman is no stranger to success, and no stranger to Minnesota baseball fans. As a MLB infielder, Newman won two World Series titles. Both of those titles came with the Minnesota Twins, 1987 and 1991. After his playing career ended, he coached and managed in the Twins organization, and later became the 3rd base coach for the Minnesota Twins from 2002-2005. Now, after some time away from managing, Newman is coming back to lead the Alexandria Blue Anchors in the 2014 campaign. The Alexandria Blue Anchors is a member of the Northwoods League playing at Knute Nelson Ball Park; GG Freitag is Director of Sales and Marketing; and Kendall Hughson is Manager/Director of Baseball Operations. 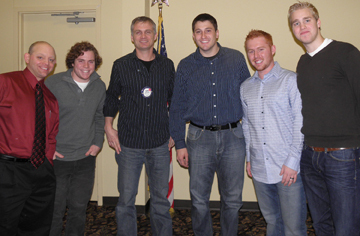 Local owners are Scott Allen, Adam Barta, Shane Schmidt and Shaynen Schmidt. Reed Becker introduced Lee Becker, board member at Butterfly Hill Nature Preschool and Kristen Peterson, director at Butterfly Hill Preschool, whose mission is to provide a loving, supportive and educational preschool environment for children and families that will foster a strong relationship between children and nature. Their indoor classroom is an extension of the outdoor learning environment and will be filled with toys for children to explore, create, and discover with. They are seeking a certification from Nature Explore for an outdoor classroom. They will be the 6th certified preschool in the state of Minnesota. The outdoor classroom will be a place where children are free to explore the world around them. Curriculum will encourage cognitive, social, emotional, creative, physical and linguistic growth. The Short-Term Care Center's recently remodeled suites have enlarged living spaces, tv, wireless internet, enlarged bathrooms, loveseat and recliner, kitchenette plus controlled heating and cooling. The Center is intended to serve those who require short-term, intensive care. This care is tailored to each patient whether you need post-surgery care, wound therapy, IV therapy or if you suffer from chronic illness. The Rehab Center is designed to provide a therapy intensive, goal driven approach to patient care leading you to a successful discharge back into the community. 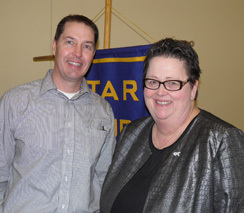 Virgil Batesole first introduced Sara Stadtherr, fellow Rotarian. Sara’s job as tourism director at Alex Hotel & Hospitality is to entice people to vacation in the Alexandria area and enjoy hospitality in the heart of lakes country. About 19% of our visitor’s dollar is spent on lodging and the other 81% on food, shopping, entertainment, etc. Virgil then introduced Kent Kopp, president of the Alexandria Area Hockey Association. AAHA is committed to providing a quality environment for youth hockey players to learn and enjoy the sport of hockey. Youth hockey, curling, figure skating, girls and boys high school hockey, Blizzard hockey in addition to all dryland events are shared at the Runesone Community Center facility. Today there are approximately 300 skaters with the projection being 400 skaters in another five years. AAHA is governed by a board of directors and their business manager handles the business side. Healthy programs are provided for everyone and the need is there for an additional facilty. The City of Alexandria would be making the final decision after cost studies, design, etc have been looked at. Another building would be a plus for the Alexandria area and the Alexandria Area Hockey Association. Chris Bartosiewski introduced Mike Roers, Lakes Area Theatre. The Lakes Area Theatre Troupe is made up of dedicated writers, directors, voice actors, musicians, sound effects technicians, and recording engineers. They accept script submissions from writers, content suitable for all ages and family friendly, for single shows or two installments. Shows are performed and recorded Friday evenings at 7:00pm. 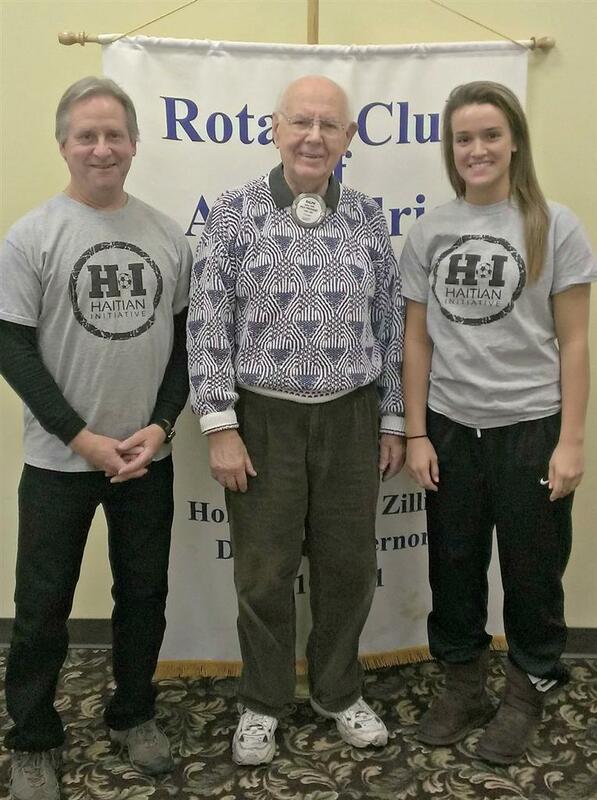 Rock Anderson introduced Kirby Karpan and Courtney Bitzan from the Jefferson High School Happiness Club. 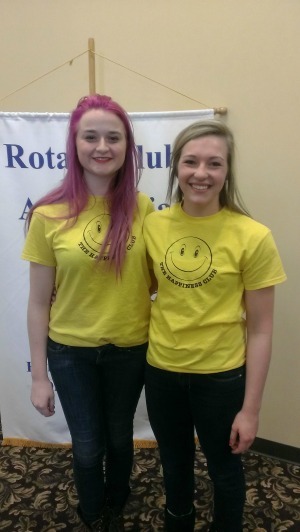 The Happiness Club was formed to make others happy in school and in our community. After visiting Northwestern College hearing about their happiness club Kirby was inspired to start a club at Jefferson; starting with five members and now has grown to more than 40 members. One of their first projects was helping at the fund raiser at the Alexandria Senior Center. Some projects at school have included serving hot cocoa and hugs to students, posting inspirational sign quotes in hallways, self-esteem signs, thank you’s to teachers. They are hoping to do more projects in the community including a movie night with seniors at nursing homes, May Day baskets and spreading happiness to others in little ways. Maybe as simple as giving their time. Mark Anderson introduced Daphne Karpan. Grand Care Technology offers “peace of mind” for the entire care giving network, while giving the loved one, independence, freedom and happiness. GrandCare combines essential health care components and social connectivity. Caregivers can be alerted if anything seems amiss via GrandCare touch screen. Knute Nelson Home Care provides personalized health care to individuals in their home. Services are tailored to meet the needs of each individual and are provided on a one-to-one basis. Nelson Gables or Grand Arbor communities ensure its residents make the most out of this stage of their life. With a long list of amenities available to all residents, those who choose to live here become a part of an active and socially-focused community, while receiving appropriate attention to all health care needs. For more than 65 years, the Knute Nelson Care Center has provided exceptional skilled nursing care to area seniors. Our commitment to innovation and compassion for those we serve has given our Care Center a reputation that precedes it. Living at the Care Center provides each resident with a home that allows them continue to enjoy life and make the most of each day, while ensuring their health needs are met. Tom Ellison, Jefferson High School Wrestling Coach was our speaker at the January 16th meeting. 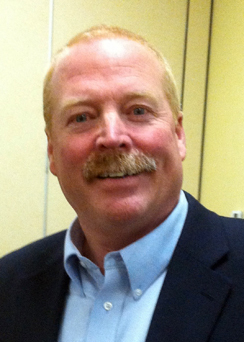 Tom is a 1979 graduate of Jefferson High School and came to Alexandria as head coach of our wrestling program in 2001. JHS Wrestling squad has 38 students and 36 are members of the “DIAL” program - Desire, Intensity, Attitude and Leadership. Students First and Athletes Second!! Alexandria is 5-1 against conference opponents so far this year and hope to have five or six wrestlers attend the state championship. 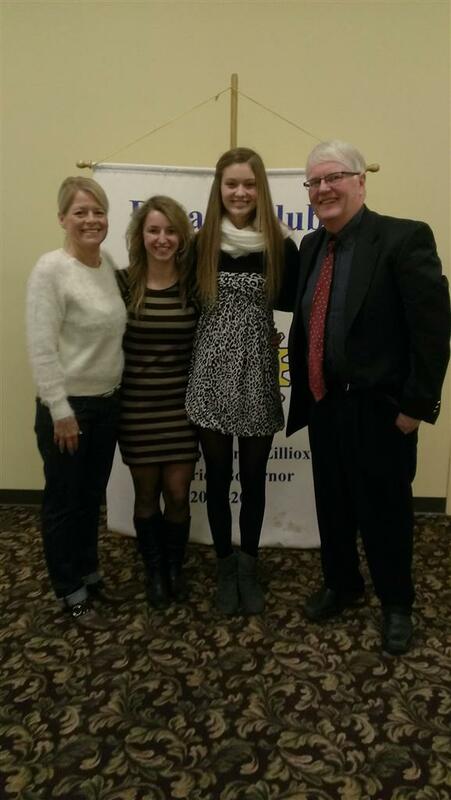 Dave Anderson introduced Wendy Kohler, JHS girls basketball coach along with students Emily Thul and Karly Betterman. Wendy has been coaching for 29 years in Alexandria. Our Cardinal girls basketball team is a team that utilizes defensive concentration and energy! Efficient, unselfish ball movement and the ability to finish plays. Their “TOP 20” teaching - thinkers and teams know how to live both inside and outside the comfort zone and find a way to stick together! Examples -”we can do this, stick with it - keep working, we’ve got this, calm down. Their record is 7-2 overall and 5-0 in CLC play. Go Cardinals!! How Much of a Difference Can You Make? Every gift - no matter the size - counts. 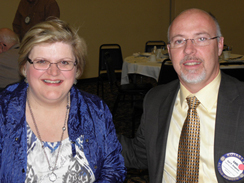 Mike Amberg introduced Corliss Stark, United Way of Douglas/Pope Counties. Corliss stressed the importance of the United Way program. Giving to United Way is the MOST EFFECTIVE way to help the whole community. Hunger is the #1 issue in our community. individuals who are homeless! Everyone counts, whether you GIVE, ADVOCATE or VOLUNTEER! Jeff Wild introduced Larry Novotny, coach of the Alexandria Aces. The Alexandria Aces Basketball Performance Team is in their 23rd year of existence. Initially beginning as a basketball handling club, the team has progressed into one of the top half-time acts in the NCAA & NBA! The Aces are comprised of boys and girls, ages 5-12. Today Josh and Andrew Wagner were the ball handlers for our entertainment! The Aces' show appeals to fans of all ages! 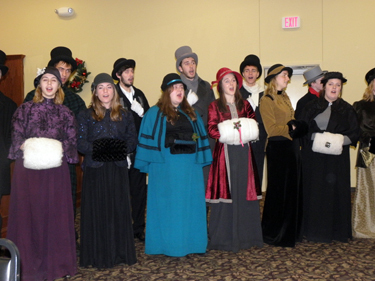 The Christmas carolers from Jefferson High School stopped by Rotary to serenade us into the holiday season. Sleep Apnea is just snoring - myth? Although snoring can be a sign of sleep apnea, there's a big difference between the two. People with sleep apnea actually stop breathing up to 400 times throughout the night. These interruptions last 10 to 30 seconds and are often followed by a snort when breathing resumes. This breaks your sleep cycle and can leave you tired during the day. 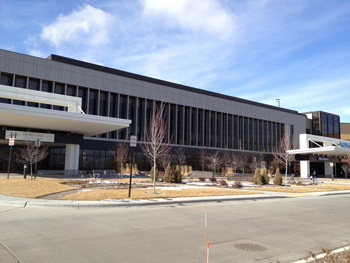 Douglas County Hospital now has four beds needed for monitoring your sleep patterns usually requiring a one night stay. For more information, contact Dave Holm at Douglas County Hospital. A group of 6 from Alexandria joined forces with fellow Rotarians and friends from Buffalo, Blaine, Fort Meyers, Florida, and San Diego, California on a service trip to Guatemala. We stayed in the city of Antigua, which features beautiful Spanish architecture and historic colonial churches. In the surroundings stand the volcanoes Agua, Fuego, and Acatenango. Fuego is frequently active. Ralph Tillitt introduced Tom Roos, Special Ed teacher /soccer coach and Anna Lee, junior at Jefferson High School. The JHS girls’ soccer team is sponsoring fund raisers to support the Haitian Initiative which is a part of the Sanneh Foundation; Tony Sanneh, a St. Paul native and recently retired professional soccer player, founded the Sanneh Foundation in 2003 with a goal of helping inner city kids. The Haitian Initiative (HI) is a collaboration of partners working together to bring sustainable programs to Haiti using soccer as a catalyst to combat the cycle of poverty. Regular school attendance and passing grades are a requirement to participate. After every practice players receive a hot meal provided by Feed My Starving Children. For most HI participants, this meal represents their only meal for the day. Tom and the team are hoping to bring the Haiti soccer team to Alexandria when they participate in the Schwann's Cup next July. 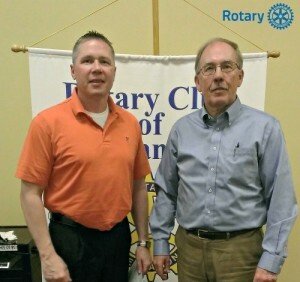 Brian Gibson introduced Mike Kennedy, former president of the Sauk Centre Rotary Club and certified financial planner with Kennedy Retirement Solutions. Whether it is selling a business and planning for succession, sending a child or grandchild to college, starting a business, buying a vacation home or retiring early, clients all have different destinations. Saving and investing money is important to helping realize those dreams, Kennedy Retirement Solutions can help you execute a sound financial program utilizing the following products and services: Tax management Investment management Retirement strategies Estate conservation Insurance and annuity products. At today's meeting Sara Stadtherr introduced Ben Klipfel, Executive Director of the Alexandria Area Arts. Ben started by presenting on the history of the theater dating back to the first musical in 1970 to the most recent shows. The theater now produces 5 different shows a year that range from comedy to drama to classics. Over 13,000 patrons attended shows last year with 240 actors contributing to the performances. The AAAA also puts on a summer academics program for the arts and organizes the very popular Art in Park event. The facility will begin a renovation process next year to help accommodate all of the performances and classes. To learn more about upcoming events or to contribute to the association, please visit their website here. Sam Steidl introduced Dave Holtz, Executive Director at Luther Crest. Luther Crest is committed to providing a safe and faith filled environment for each person while at Luther Crest Bible Camp. In 2013 over 1,000 kids (K-12) were involved in their summer program. Since 2008, Luther Crest has reestablished itself as a place focused on mission and the work of bringing people young and old into a deeper relationship with one another and with Christ. 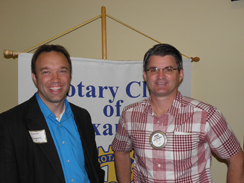 Rotarian Dustin Thornburg welcomed Al Olson from the Caring Hands Dental Clinic at the October 17, 2013, meeting of Alexandria Rotary Club. Caring Hands Clinic is a nonprofit program aimed at improving dental care and education for the citizens served by Medical Assistance or Minnesota Care. They provide everything from toothbrushes to regular cleanings to emergency care. The clinic operates with support from donation and grants from individuals, local businesses, dental organizations, and earned reimbursements from the MN Department of Humans Services. For more information on the clinic, visit the website here. 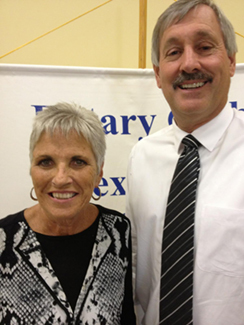 Rotarian Kathy Nohre welcomed Alexandria Technical & Community College President Kevin Kopischke as the guest speaker at the September 12, 2013, meeting of the Alexandria Rotary Club. Alexandria Technical & Community College's retention, graduation, and career placement is among the highest of all Minnesota public two-year colleges. In fact, the college successfully placed an average of 90% of its graduates in their chosen career field for several decades. The college provides quality education, whether you are planning to start your career or just beginning your education. 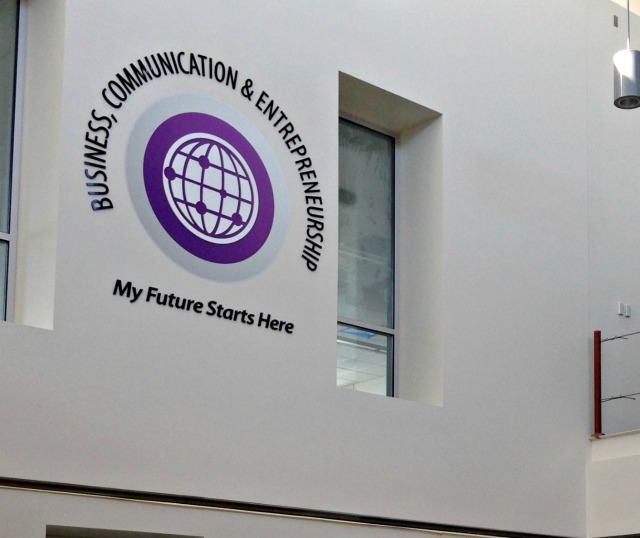 ATCC is affordable—ranking (among MnSCU colleges) with the 3rd largest endowment balance, 2nd largest amount of scholarship dollars awarded and 2nd largest contributions from business and industry. The college's foundation awards more than $375,000 in student scholarships each year. 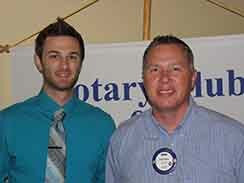 Pharmacy student Devon Rudolph presented the program at the July 25, 2013, meeting of the Alexandria Rotary Club. Rudolph, an intern at the Thrifty White Pharmacy, spoke on prescription drug abuse. He noted that unintentional drug poisoning is now the second largest cause of accidental death, and that one of four high school students will abuse prescription medications. Officer Jim Gripne of the Alexandria Police Department also was a guest at the meeting. He briefly overviewed the police department's prescription drop-off site, located just inside the new police headquarters. The drop-off bin has collected more then 300 lbs. of unwanted medication to date. 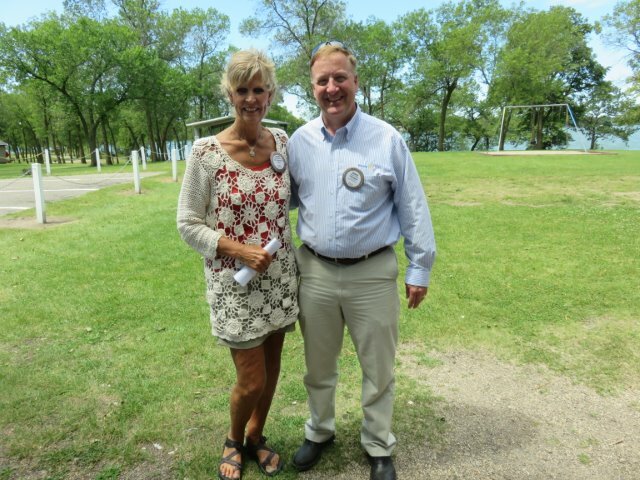 At the June 20, 3013, meeting of the Alexandria Rotary Club, Brad Nyberg introduced Douglas County Surveor Gary Stevenson. Stevenson demonstrated the GIS (Geographic Information System) website that it available for public use through the county's main web page. Members of the Alexandria Rotary Club spent a sunny day at the Douglas County Historical Society, putting finishing touches on the garden shed there. The historical garden and shed were funded in part through a Rotary grant. 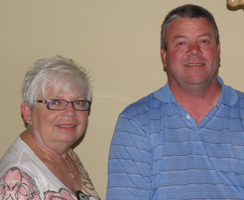 At the June 13 meeting of the Alexandria Rotary Club, Linda Roles introduced Mark Foss, LifeRight Outreach. Mark was a drug dealer and addict for more than 30 years, until he turned his life around in April 2002. He founded LifeRight Outreach, a sober environment for those in addiction recovery. 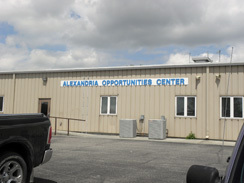 The Alexandria Rotary Club met at the Alexandria Opportunities Center for its May 30, 2013, meeting. Center Director Mike Burke provided some background on the work of the center, which has been in existence in its present form for 26 years. The center employs 135 disabled persons who do piece work for local manufacturers. After lunch, the group had a tour of the facility. 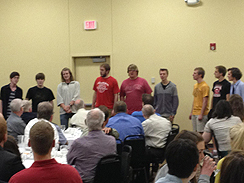 Rotarians were treated to a pop concert by the Jefferson High School choir at their May 23, 2013, meeting. Thanks, choristers! 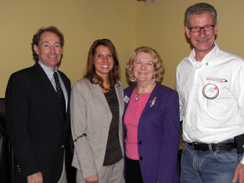 At the April 25, 2013, meeting of the Alexandria Rotary Club, Reed Becker introduced Chuck Gulsvig and Ashlie Bradley of Sanford Health. Gulsvig spoke on Sanford's overall mission and changes and enhancements to services since Sanford acquired Broadway Medical Clinic. 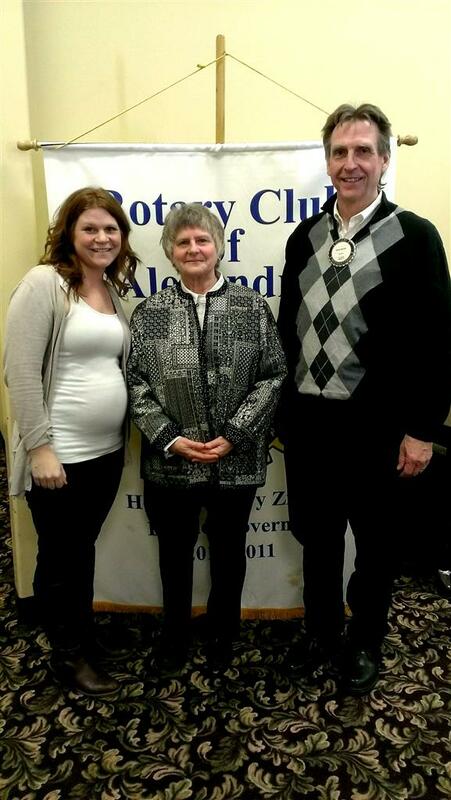 At the April 18, 2013, meeting of the Alexandria Rotary Club, Rotarian Keith Meyer introduced Mary Yaw, founder of Titus2. Yaw updated the club on activities of the Titus2 ministry, which provides transitional housing and divorce care services for women. 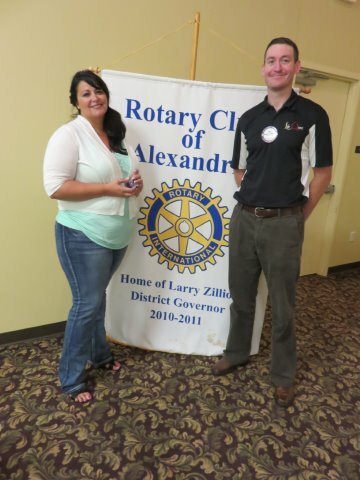 Two new members were inducted at the April 18, 2013, meeting of the Alexandria Rotary Club. Welcome, Tyler Golberg and Eric Ristvedt! 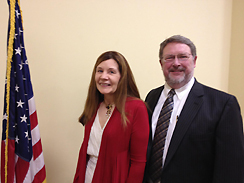 At the March 7, 2013, meeting of the Alexandria Rotary Club, Rotarian Mike Johnson introduced guest speaker Carliss Stark. Carliss appeared on behalf of the United Way of Douglas & Pope Counties, and shared the impact of that organization's work. She noted that the top issue the agency is dealing with currently is hunger. The United Way serves 250-300 families monthly at its food drop and provides bags of food at area schools for youngsters who would otherwise go hungry over the weekends. 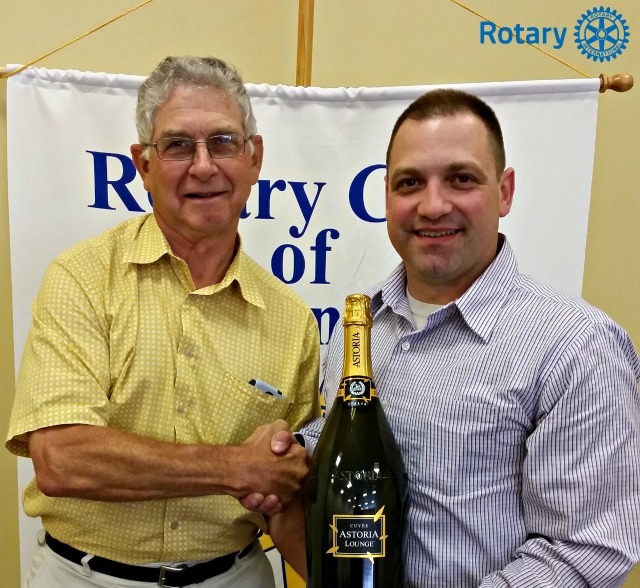 Welcome to our newest Rotarian, Bill Saul. Welcome to the club! 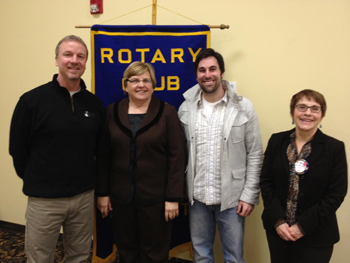 At its February 21, 2013, meeting, the Alexandria Rotary Club welcomed Jeff Bartholomew, director of the local YMCA. He spoke to the group on the success of the YMCA in its first two years and a new, $2.5 million capital campaign that will construct new child watch and multi-use space as well as outdoor fields at the facility. If the campaign is successful, the YMCA expects to have the new space available for use by January 1, 2014. 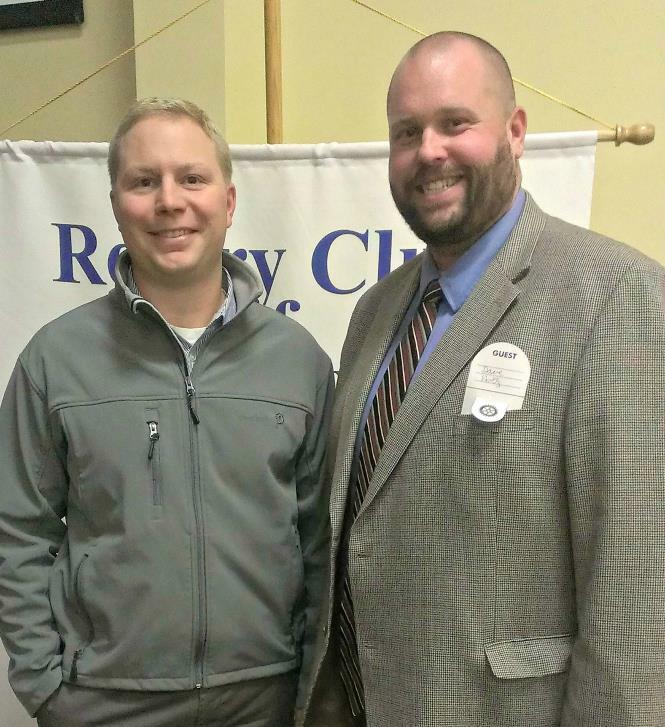 At the February 14 meeting of the Alexandria Rotary Club, Rotarian Shawn Reilly introduced Craig Kronholm of the Coalition for Impartial Justice. The broad-based, non-partisan organization advocates for a constitutional ballot question that allows voters the opportunity to decide how they would like to select and retain judges in Minnesota. 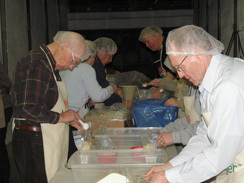 Members of the Alexandria Rotary Club and their families packed 10,000 meals to be delivered to hungry kids locally and around the world. 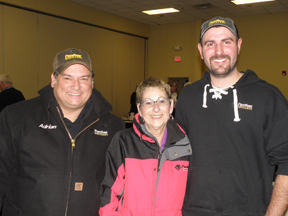 The Kids Against Hunger event was held February 7, 2013. 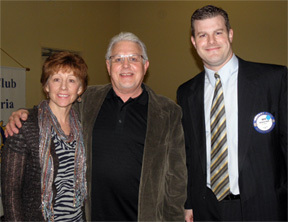 At the January 24, 2013 meeting of the Alexandria Rotary Club, Nick Heydt introduced his father, John Heydt, and Carol Wenner, representatives of the Inclusion Network. The organization's mission is to provide access to learning opportunities, dialogues and experiences which support actions toward equality and justice to strengthen our community. The group provides training, and is beginning to provide resources on bullying. 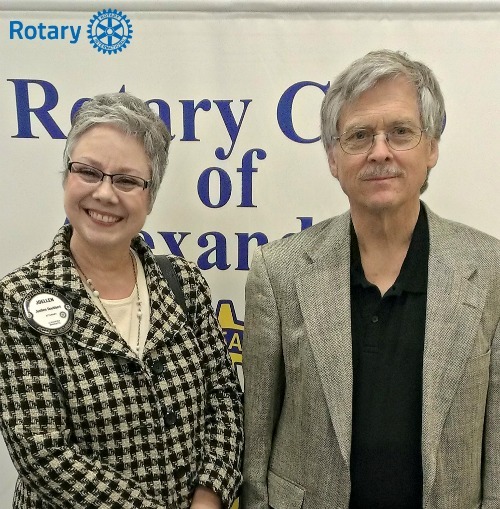 At the January 17 meeting of the Alexandria Rotary Club, Rotarian Stuart Henrickson introduced Sandy Domine of the MS Society, who spoke on that organization's mission and work. 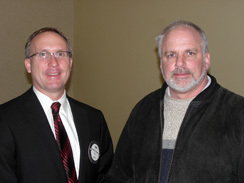 At the January 3, 2013 meeting of the Alexandria Rotary Club, Brett Grinager, master distiller for the Panther Distillery in Osakis, spoke to the group about the process and challenges of starting a distillery and the company's plans for the future. Panther Distillery was scheduled to launch its first beverage, "Whitewater Whiskey," in early January. 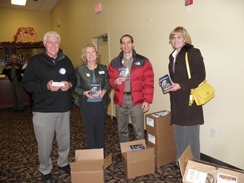 This week Rotarians will be delivering dictionaries to third grade classes in the area, an annual project of the club. Pictured are members Bill Bolm, Coni McKay, Jeremy Anderson and Nicole Nettleton. The dictionaries are funded through the club's fundraising efforts. 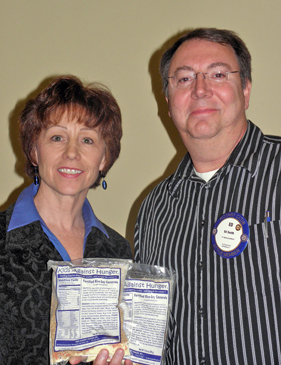 At the November 29, 2012, meeting of the Alexandria Rotary Club, Brian Gibson welcomed Jenna Payne of Someplace Safe, a nonprofit organization that seeks to eliminate violence in West Central Minnesota and beyond. She provided information about "breaking the silence" around domestic abuse, which is the most common killer of women in the United States; medical costs associated with domestic violence total $5.8 billion annually. She also shared tips for identifying and responding to incidences of domestic violence. Someplace Safe served 780 victims of domestic abuse in 2012. 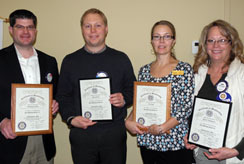 Several new members were inducted into the Alexandria Rotary Club at the November 29, 2012, meeting. 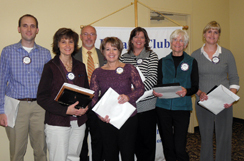 Rotarian Todd Emmons installed the members, who included (left to right) Pat Kalina, Beth Telander, Carl Vaagenes, Kathy Patton, Sara Stadtherr,Connie Mondry and Nicole Nettleton. Todd Emmons At the November 8, 2012, meeting of the Alexandria Rotary Club, Todd Emmons welcomed fellow Rotarian and Alexandria Chamber of Commerce Executive Director Coni McKay. Coni spoke on the Leadership Alexandria program, established in 1991. To date, 400 individuals have participated in the program, which offers specialized training and experiences designed to build leadership skills. Mike Weber, Alexandria City Planner and 1992 graduate of the course, and Chris Mohr of Glenwood State Bank, a 2012 alumna of the program, also spoke about how participation impacted their lives and careers. It's Rotary Rose Sale Day! Rotarians Jim Bill and Vic Dale were happy to pose with two dozen of the exquisite roses available October 25 through the annual Rotary rose sale. 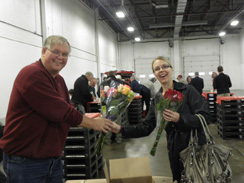 Members collected their roses at the H.Boyd Nelson facility, which has kindly hosted the event for several years. At the October 18, 2012, meeting of the Alexandria Rotary Club, member Sue Jung introduced Tami Bredeson of Carlos Creek Winery as guest speaker. She discussed the history of the winery and how it operates. The Alexandria Rotary Club was proud to celebrate Honorary Member Bud Kolstad's 99th birthday at the October 18, 2012, meeting. 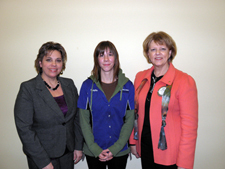 He's pictured here with members Kathy Patton and Janet Baker Nevalainen. Hats off to you, Bud! 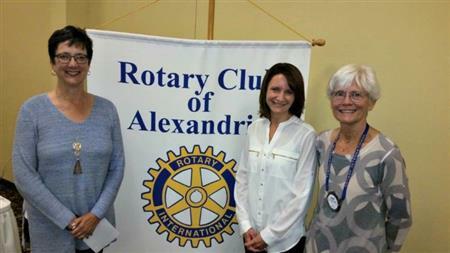 At the October 11 meeting of the Alexandria Rotary Club, a crack team of "sales consultants" presented tips and strategies to boost the club's annual Rose Sale fundraiser. 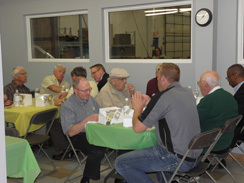 The club has set a goal of increasing the number of orders by one dozen per member this year. The Alexandria Rotary Club welcomed the new coach and two players from the Alexandria Blizzard hockey team to their October 4 meeting. Coach Jeff Crouse introduced players Garrett Skinner and Ian Eckland and provided an overview of the team and its activities. The team recently transitioned to a Tier 3 team, comprising players aged 16-20. They are 3-2 on the season so far. What Bridges Are You Building? At the September 20, 2012 meeting of the Alexandria Rotary Club, Rotarian JoEllen Doebbert encouraged members to reflect on the "bridges" they are constructing to leave to future generations. How do we make a difference in the lives of others? What are our passions, and how are our actions a reflection of what's important to us? At the conclusion of the presentation, several Rotarians shared their stories of "bridge-builders" they've encountered in their own lives. 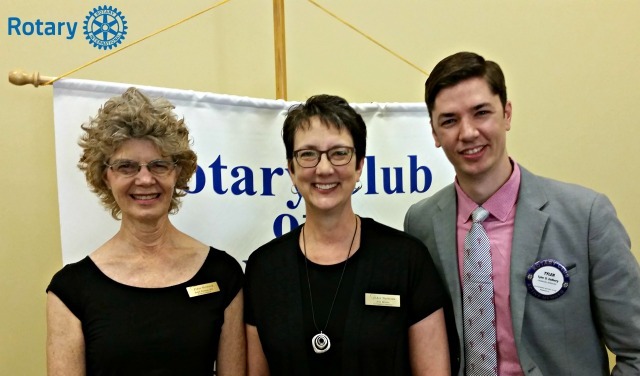 "The Best Bargain in Town"
At the September 13 meeting of the Alexandria Rotary Club, Rotarian Vic Dale introduced Karen Simmons, director of the Douglas County Library. Simmons, who calls the library "the best bargain in town," discussed how new technologies, especially digital books and e-readers, are changing how libraries operate. She also noted that the local library has recently begun programming targeted at teens. She reminded members that September is Library Card Sign-Up Month and invited them to join the Friends of the Library. 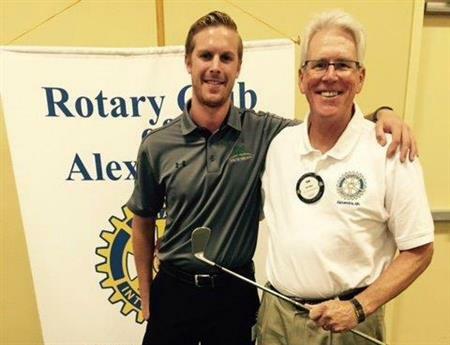 The atmosphere was electric at the September 6 meeting of the Alexandria Rotary Club, as Rotarian Al Crowser and several colleagues from Alexandria Light & Power provided the program. 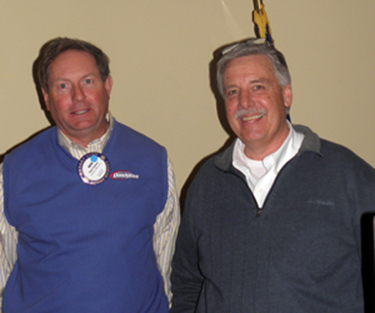 Al introduced Board of Public Works members Steve Senden, John Perino and fellow Rotarian Rick Paulsen. After briefly overviewing ALP's important role in the community, Al turned the program over to Operations Manager Scott Deitz. He offered more information, including updates on projects ALP has recently completed or will soon undertake. 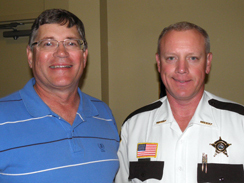 Rotarians were on their best behavior at the August 30 meeting of the Alexandria Rotary Club, which welcomed Douglas County Sheriff Troy Wolbersen as special guest. Wolbersen, introduced by Kim Collins, described the new ARMOR (Allied Radio Matrix for Operational Response) radio system that will replace the county's antiquated analog system. The infrastructure of the new digital system will be funded by the state of Minnesota, while the county will provide all stationary and mobile radio equipment. The new system will allow greater ease of communication among law enforcement and other public service agencies. 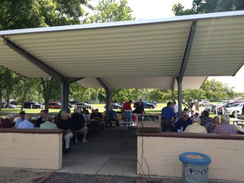 The Alexandria Rotary Club held the August 9 meeting at City Park for a fish fry. It was a sunny but cool and comfortable day in Alexandria and, as usually is the case for this annual event, Rotarians brought along many guests. In lieu of the normal weekly guest speaker, the guests were put to work sharing their biography. Each was handed the microphone and learning and laughing ensued. 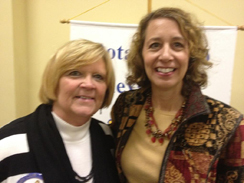 Club members also welcomed the newest Rotarian in Alexandria, Pat Kalina. Pat is Marketing and Communication Coordinator at the Alexandria Area Economic Development Commission. 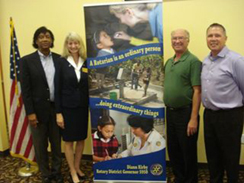 The Alexandria Rotary was honored to welcome District Governor Bob Stoll to its August 2, 2012, meeting. Governor Stoll shared his story of how overcoming an abusive childhood inspired him to want to make a difference in the world through Rotary. 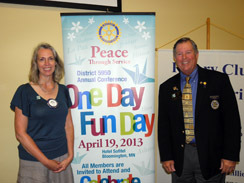 He also reminded members of Rotary's many accomplishments, goals and programs, including the fight to eradicate polio. He further outlined Rotary International's three-pronged strategic plan to support and strengthen clubs, focus and increase humanitarian services and enhance Rotary's public image and awareness. 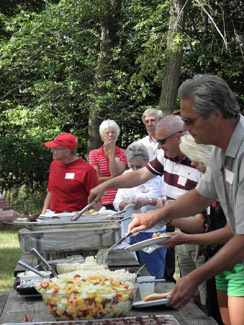 Alexandria Rotary members and their guests enjoyed a delightful picnic supper at Carlos State Park on July 26, followed by games including bocce ball, washer toss and kickball. 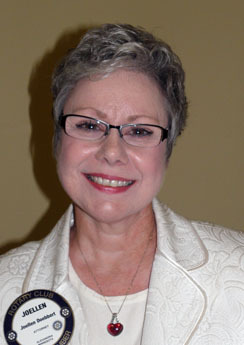 At the July 19, 2012, meeting of the Alexandria Rotary Club, Rotarian Linda Kloubec introduced guest speaker Mike Burke. Burke is the new director of the Alexandria Opportunity Center, a nonprofit organization that provides employment opportunities and assistance to individuals with physical and/or cognitive disabilities. The center currently serves 133 clients. Clients at the center typically do piece work, and the center processed 12 million units of various pieces last year. The AOC also assists with supportive employment of individuals in the community. At the June 28, 2012, meeting of the Alexandria Rotary Club, 2011-12 President Rachel Barduson concluded a successful year and handed the gavel to incoming President Patty Peterson. 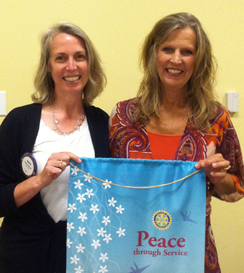 The international theme for the upcoming Rotary year is Peace through Service. Following the transfer of power, the membership divided into committee groups to conduct a planning assembly for the coming year. 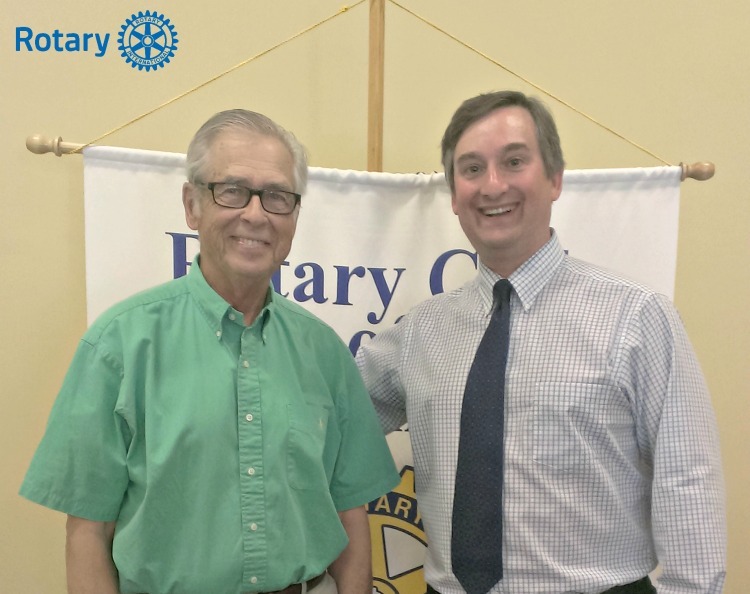 At the June 14 meeting of the Alexandria Rotary Club, Rotarian Craig Mische introduced Jason Bergmann, who spoke to the club about Heifer International. The organization provides livestock and other resources and supports sustainable agriculture worldwide. Bergmann noted that Heifer International's work in helping individuals and families become self sufficient has the secondary effect of supporting education and the empowerment of women in those communities as well. 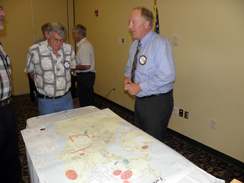 Members of the Alexandria Rotary Club learned about changes to the pork industry at their June 7, 2012, meeting. 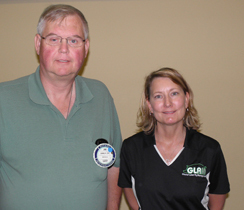 Rotarian Jim Bill welcomed guest speaker Pam Gierke of Gierke Farms, who spoke on behalf of the Pork Producers Association. She discussed how new science and technologies, especially in genetics, are impacting the industry by creating more efficient farming and healthier, leaner product. Rotarians learned about the importance of tourism to the local economy at the Alexandria Rotary Club's May 23, 2012, meeting. 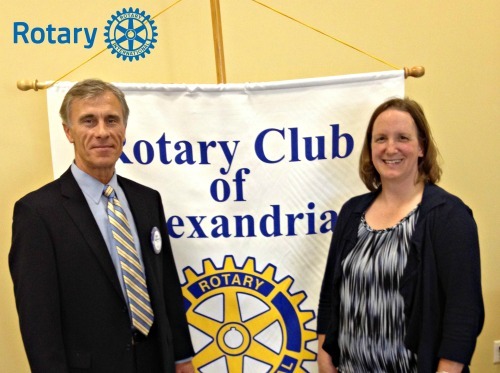 Rotarian Virgil Batesole introduced Sara Stadtherr, director of the Alexandria Hotel & Hospitality Association. 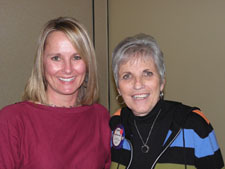 She spoke on the ways the association promotes the area to potential visitors and supports local programs and events. She reported that tourism and the hospitality industry create $92 million in sales annually and support 2,087 jobs in Douglas County. 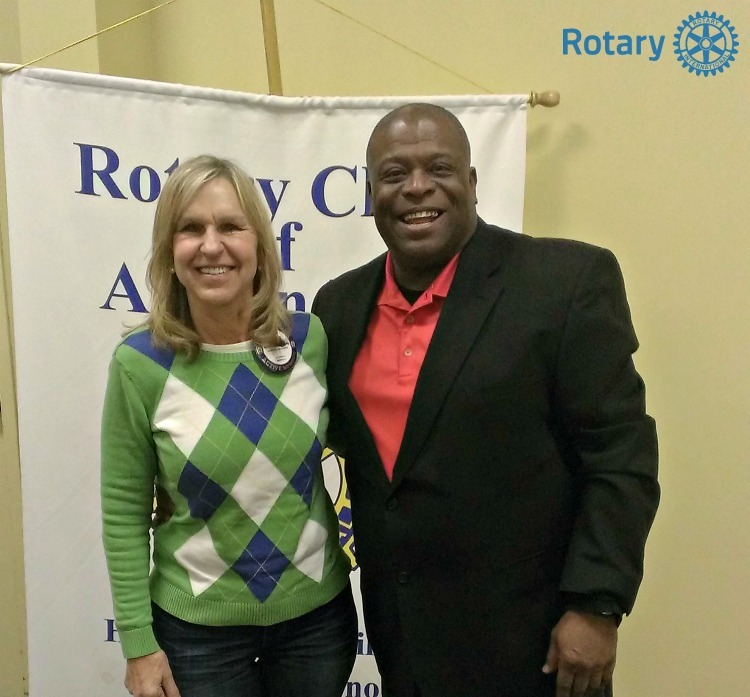 At this week's Alexandria Rotary Club meeting, members learned about Diversity Resource Action Alliance (DRAA). Formed in 2003, DRAA is a volunteer community organization committed to strengthening the understanding and appreciation of diversity and cultural differences in the greater Alexandria Area. Deb LeDoux began the presentation with a background an overview of DRAA including its mission: "DRAA provides a platform for building and strengthening community understanding and appreciation of diversity and cultural differences". Scott Keehn followed with a information about a Inclusion Network training. Inclusion Network volunteer trainers provide diversity and inclusion training, consulting and facilitation services to empower people to take action towards greater equality. If you'd like to learn more about DRAA, visit www.diversitytoday.org. You can also find them on Facebook at facebook.com/diversityresourceactionAlliance. 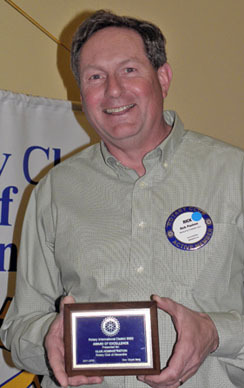 Rick Paulsen, chair of the Fundraising Committee, accepted a District award for the Alexandria Club's bean bag fundraiser, which garnered funds for the Polio Plus campaign. The Alexandria Club was recognized with a Honorable Mention Award for membership development at the District Conference. 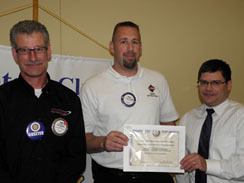 The membership team, comprising Todd Emmons, Brian Simon and Jeff Montgomery, accepted the certificate at the April 19 meeting. 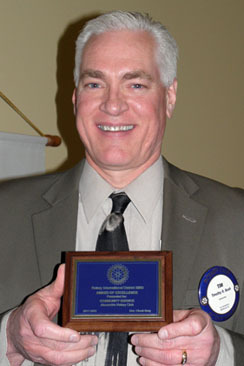 Tim Bush, club president for the 2010-11 program year, accepted the district Award of Excellence for community service. The award recognized the club's $15,000 contribution to the Maritime Gardens in Alexandria. The club funded construction of a gazebo in the new gardens. 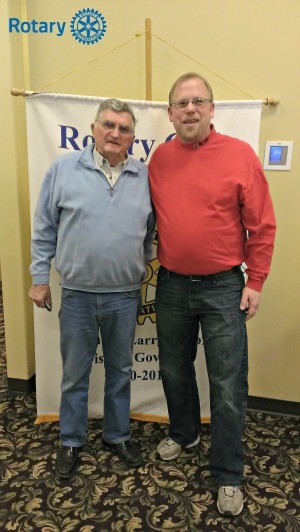 Longtime Rotarian William "Rock" Anderson received a "Service Above Self" Award from the district in recognition of his many years of committed service to the local club. Left: President Rachel Barduson offers Anderson congratulations on behalf of the club. Jefferson High School sophomores Bryce Klang (pictured left), Kacy McCormick and Molly Schouweiler, along with their adviser, JHS math instructor Jeremy Bydlon, were special guests at the April 19, 2012 meeting of the Alexandria Rotary Club. 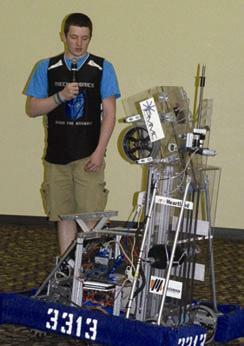 The students are members of the Mechatronics Robotics Team. The club participates in competitions in which they are tasked with designing and constructing a functional robot capable of performing specified actions. The students demonstrated their current robots, nicknamed Murphy and Rover. 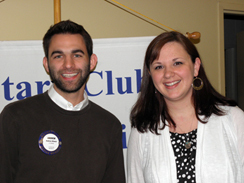 At the April 12 meeting of the Alexandria Rotary Club, Rotarian Andrew Wiener introduced his sister, Kristin Grode, as the guest speaker. Kristen founded an organization, "The Diaper Drive," that collects disposable diapers for distribution to needy families through local social service agencies. Since beginning the effort in 2010, the group has collected nearly half a million diapers, of which 140,000 were collected through the Alexandria chapter. The Diaper Drive has grown to six chapters in Minnesota and the Dakotas. 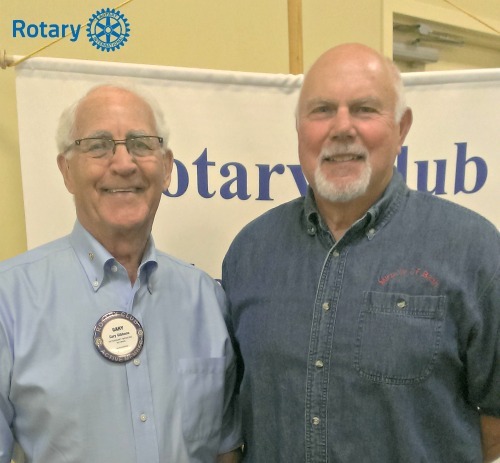 “Giving Back” was the theme of the Alexandria Rotary Club’s April 5 meeting, as two Rotarians, William “Rock” Anderson and Craig Mische, will be honored for “service above self” at the district conference; additionally, the club learned about the Alexandria Community Foundation’s efforts. 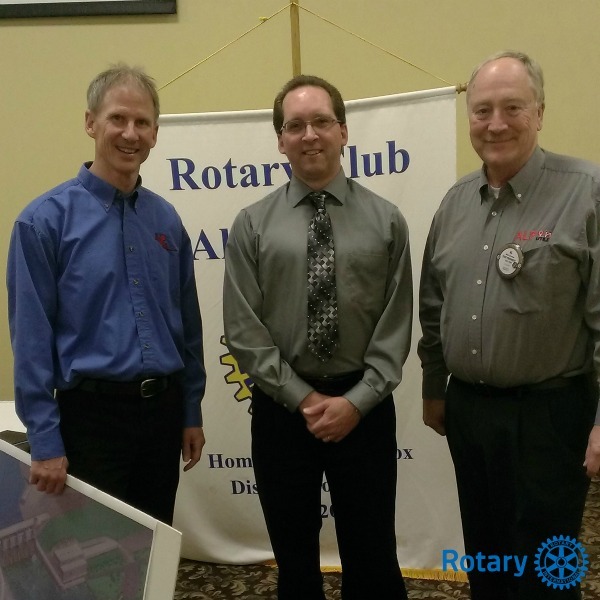 Rotarian Tim Bush introduced Jeff Restad, member of the AACF’s Board of Directors, and Glen Tautges, a representative of the Central Minnesota Community Foundation. Restad shared that the Alexandria Community Foundation partnered last year with the Central Minnesota Community Fund, headquartered in St. Cloud. The partnership allows the local organization to leverage the expertise of the SCMCF. The Alexandria foundation currently holds nearly $700,000 in unrestricted funds and recently received an Otto Bremer Foundation grant of $360,000. 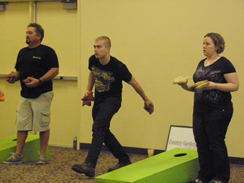 The second annual bean bag tournament was held Saturday, March 17 at Broadway Ballroom. Watch for a recap of the event coming soon, and check out additional photos in the photo gallery! 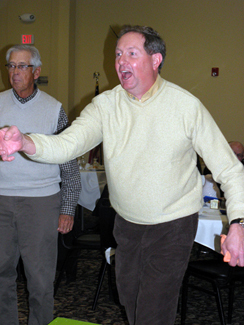 Despite frigid temperatures, members of the Alexandria Rotary Club were warmed at their January 19, 2012, meeting by a reminder of how Rotary makes an impact in the community. 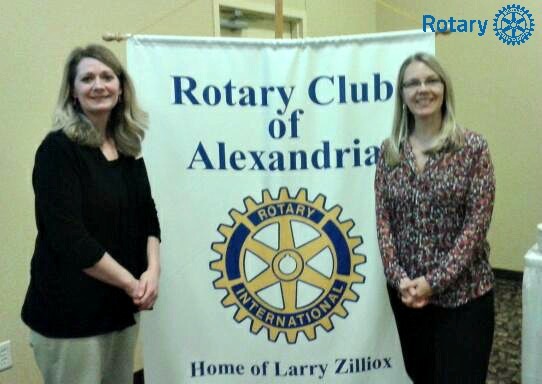 Rotarian Linda Roles introduced Linda Dolan, Director of Scholarships at Alexandria Technical & Community College. 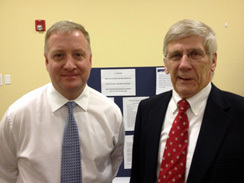 Dolan noted that the Alexandria club has funded two students with $500 scholarships for the current academic year, and has awarded a total of nine $500 scholarships over the past five years. She then introduced Stephanie Schultz, a student in the marine engine program at ATCC and a recipient of the Rotary scholarship this year. At their first meeting of 2012, the Alexandria Rotary Club welcomed Jennifer Odland of the Alexandria Technical & Community College Foundation. 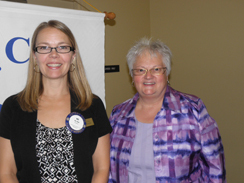 She was introduced by Rotarian Kathy Nohre. Jennifer discussed the history of the new student housing project at ATCC, scheduled to receive its first students this coming fall. The Alexandria Rotary Club was awarded a $500 neighborhood community grant to furnish a new hobby room at Grand Arbor senior living center. 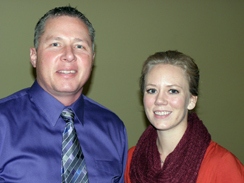 Larry Zilliox presented the check to Knute Nelson Home's Katie Perry at the December 22 meeting. 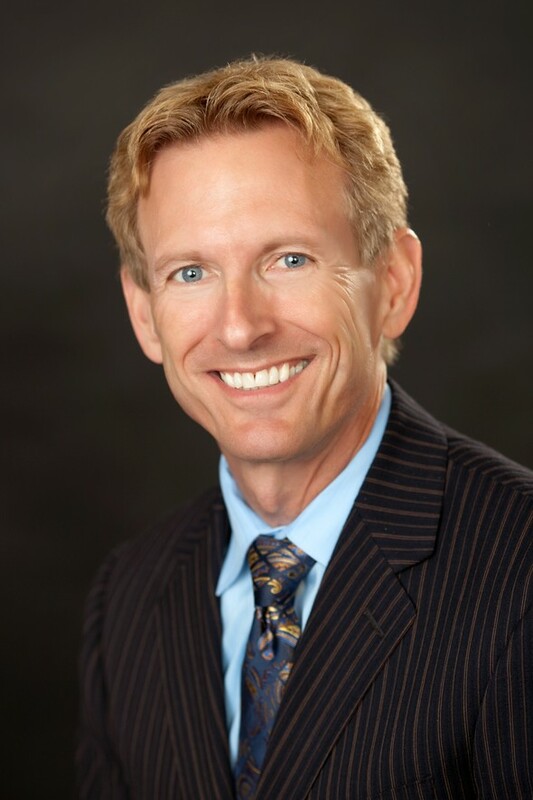 Give a warm welcome to our newest member, Andrew Wiener, an attorney with Tillitt, McCarten, Johnson & Haseman, Ltd. Andrew was sponsored by Ralph Tillitt. Glad to have you with us, Andrew! 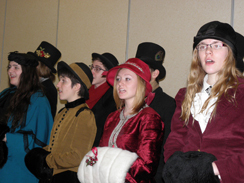 The Alexandria Rotary Club was entertained at its December 15 meeting by the Jefferson High School Carolers. We extend our deepest sympathies to the family of Don Kramer, who passed away Tuesday, November 8. 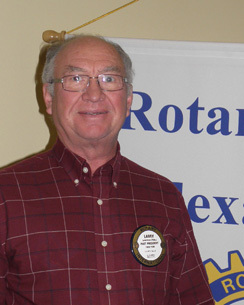 Don had been a member of the Alexandria Rotary Club since 1972. Mass of Christian Burial will be held Wednesday, November 16 at 11 a.m. at St. Mary’s Church in Alexandria. Visitation will be Tuesday, November 15 from 4 to 7 p.m. with parish prayers at 4:30 p.m. at Anderson Funeral Home. Don was a faithful member and cheerful presence at Rotary meetings, and will be deeply missed. 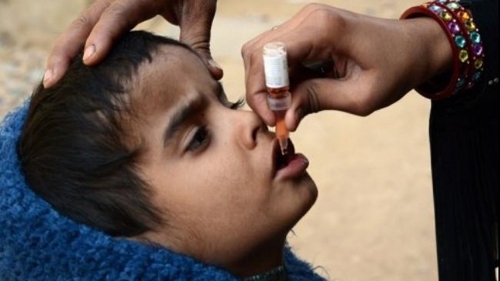 We're THIS CLOSE to Ending Polio! Former District Governor and Alexandria Rotarian Larry Zilliox demonstrates how very close we really are to ending Polio in the world. Condolences to Dave Anderson on the loss of his mother Lavonne. We also extend our sincere sympathy to Larry Zilliox, whose friend Sue Fischer passed away on Saturday. Also, please keep Don Kramer in your thoughts and prayers, as he has suffered a stroke. We will post more information as it becomes available. World service is one of the four major avenues of service for Rotarians. SafeWater Plus: Districts 5950 and 5960 are partnering with World Vision and Haiti Outreach for a $2 million safe water project in the Central Plateau Region of Haiti. We’re in the process of drilling and repairing 141 wells, building 1,200 latrines and providing health and sanitation education. Ambassadorial Scholarships. Rotary offers the world’s largest privately funded international scholarships program. World Community Service. 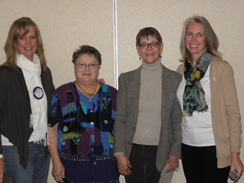 District 5950’s World Community Service Committee coordinates designated matching grant funds from Rotary International. Youth Exchange. Youth Exchange provides opportunities for young people to meet people from other cultures and to live in their countries and homes – enriching the lives of both families and countries. Rotary Foundation. The mission of the Foundation is to advance world understanding, goodwill and peace through the improvement of health, the support of education and the alleviation of poverty. Group Study Exchange. GSE is a vital part of how Rotary builds international community. For more information about Rotary’s world service initiatives, visit www.rotary.org. 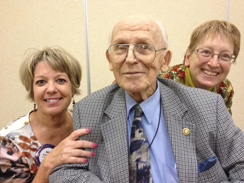 Happy 97th birthday October 13 to Rotarian Bud Kolstad! 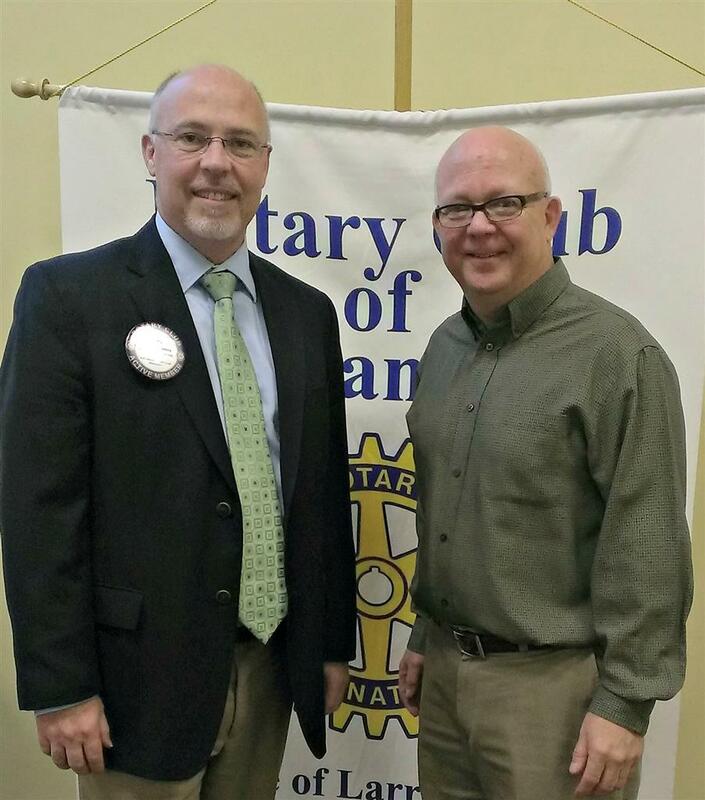 Rotarian Brad Nyberg introduced Dave Rush, Land and Resource Director, who provided an overview of the Douglas County Comprehensive Land Use Plan. Also, a couple of high-class sales consultants provided training for the upcoming rose sale fundraiser. Back in 1988 the vaccine for polio was developed. After 25 years the number of cases of polio has dropped by approximately 99%. This figure is one that Rotary International, and everyone else involved in the fight, should be proud of, but there is still work to be done. One more push and a polio-free world could become a reality. When we realize what we can achieve in Rotary – when we really engage Rotary – that’s when lives change. We change the lives of the people who need us. And along the way, our lives are changed as well. That’s what our theme is all about in 2013-14: Engage Rotary, Change Lives. District Governor Diann Kirby has set our District's goal for this year's Annual Campaign at $1 million ... and we can do it! We've been close before. This time, with your help and early commitment, we will make a large contribution to The Rotary Foundation so it can continue its important work of doing good in the world. Our District’s goal of achieving 2.5% membership growth can be reached by tapping into persons unfamiliar with Rotary today. 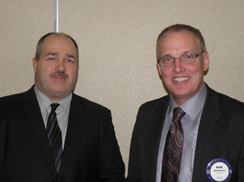 At the April 4, 2013, meeting of the Alexandria Rotary Club, Rotarian Mark Maloney welcomed Pete Thomes, director of Biz to Biz. The organization is a referral-based group that seeks to increase revenue for its members. 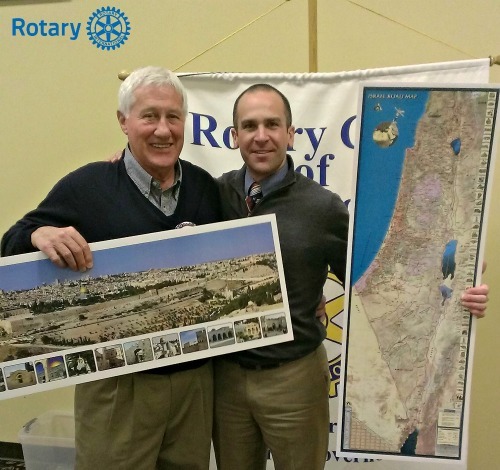 Member Larry Zilliox spoke at the December 27 meeting of the Alexandria Rotary Club on his recent trip to Bangladdesh and Nepal. Zilliox was one of 70 international volunteers who participated in Habitat for Humanity Bangladesh's first large-scale volunteer build. The volunteers worked to complete 10 brick houses. Zilliox also shared slides and anecdotes from his stay in Nepal. Once again, the Jefferson Carolers provided wonderful entertainment for the Alexandria Rotary Club's December 20 meeting. Past President Rachel Barduson and current President Patty Peterson presented a check for $5,000 to representatives Beth Hoover and Annie Skoglund of the Douglas County Historical Society. The funds, from a district grant, will be used to construct a shed for the Historical Society's garden. 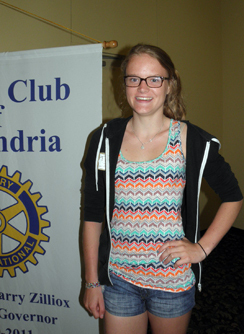 At the July 5, 2012 meeting of the Alexandria Rotary Club, guest Rotarian Corrine Lewis introduced her special guest, 18-year-old Tirza Wonderwolf from near Amsterdam in the Netherlands. Tirza shared some information about her home country and the differences between The Netherlands and what she's seen here in the United States. Coach Randy Albers and three members of the Jefferson High School fast-pitch softball squad were special guests at the May 10 meeting of the Alexandria Rotary Club. Albers spoke briefly of his own softball history, and the team members - Lauren Trumm, Macaille Lucas and Taylor Ellingsen - introduced themselves and answered questions about the team and their sport. Homes, hope and community were the theme of the March 29 meeting of the Alexandria Rotary Club, as Habitat for Humanity Executive Director Lori Anderson shared the work of that organization in Douglas County. Now celebrating its 15th year, Habitat has constructed 30 homes since 1997 and has five projects planned for the upcoming build season. The group also contributes internationally, sending a delegation to Cambodia last year to work on Habitat homes in that impoverished region. 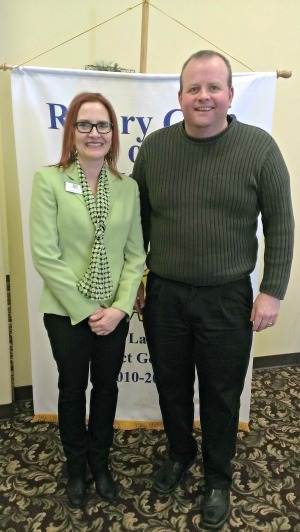 ; At the March 8 meeting of the Alexandria Rotary Club, the members gained more information about the zebra mussel threat from guest speaker Bonnie Huettle (pictured here with Rotarian Sam Steidl). She is the president of the Douglas County Lakes Association, an organization that promotes awareness and prevention of invasive species in area lakes. 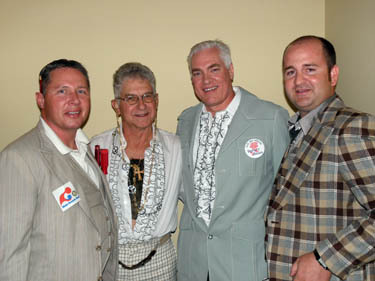 Also, the club got a preview of the March 17 beanbag tournament when Nick Heydt, Brad Nyberg, Wayne Elton and Rick Paulsen (pictured at left) demonstrated their bag-throwing techniques. 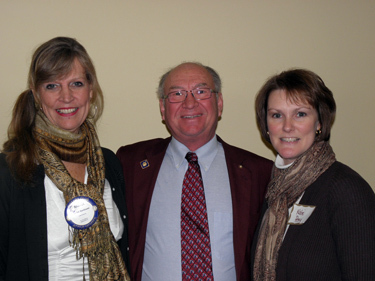 At the March 1, 2012 meeting, members of the Alexandria Rotary Club welcomed Carol Wenner, fundraising director for the Alexandria branch of Kids Against Hunger. She shared that the organization, founded by Richard Proudfit, packs specially developed meal packets that are shipped around the world; in addition, a third of the meals packed stay in the local community to feed the hungry here. 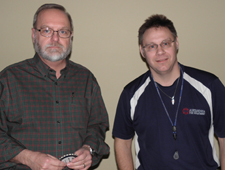 At the February 23, 2012 meeting of the Alexandria Rotary Club, Rotarian Rick Paulsen introduced Chuck Bokinskie. Bokinskie, a member of the local Viking Sportsmen, Inc., organization, shared that group’s goal to return the Alexandria lakes area to its previous glory as the “fish bowl of the nation.” To date, the organization has stocked 21 lakes with more than half a million walleye fingerlings. The Alexandria Rotary Club visited Douglas County Hospital to learn about recent additions to the facility. 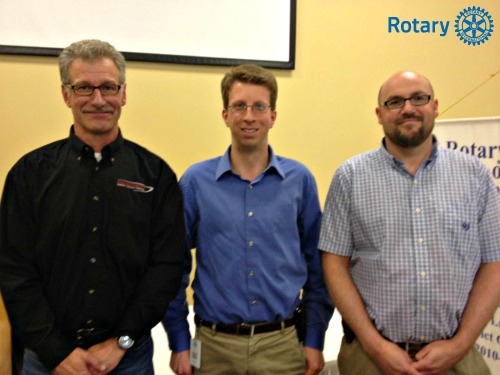 Rotarian Carl Vaagenes hosted the club. The hospital is a county-owned acute-care hospital with 127 beeds serving approximately 150,000 people in Central Minnesota. 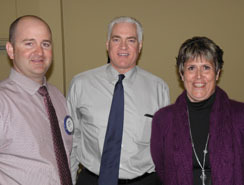 Tom Wacholz (ORB Management), Dee Peshek (Chairperson of Luther Crest's Board) and Rob Barse (ORB Management) were invited to the February 2 Rotary Club meeting by Rotarian Jody Shaskey-Setright to share Luther Crest's vision of their future.Originally a boys' camp, Luther Crest is now a year-round retreat center. 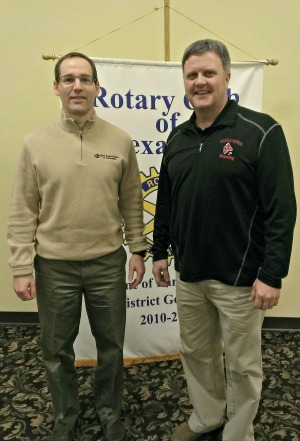 At the January 27 meeting of the Alexandria Rotary Club, member Jeff Schiffman introduced Alexandria Fire Chief Jeff Karrow. Karrow provided a dissection of the major Sun-Opta fire of January 2011, relating how the fire department responded to the 29-hour crisis. The fire fighters battled -34 F temperatures in addition to the fire, which complicated the operation. 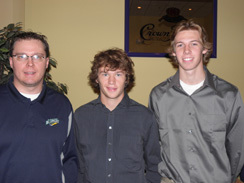 Representatives from the Alexandria Blizzard hockey team were the special guests at the December 29, 2011 meeting of the Alexandria Rotary Club. 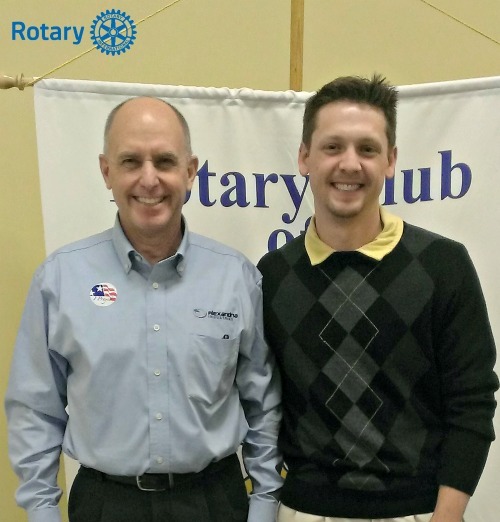 The team's business manager, Bryant Black, was introduced by Rotarian Jason Pohlen. Black was joined by team co-captains Tom Williams and Vadim Gyesbreghs as well as Coach Doc DelCastillo. 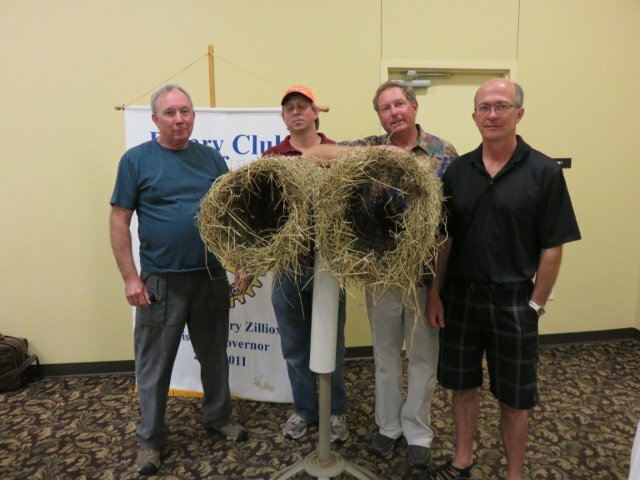 Welcome to your online HQ for the Alexandria, Minnesota Rotary Club. Here you will find news, member lists, committee assignments, upcoming events, your member data and more!